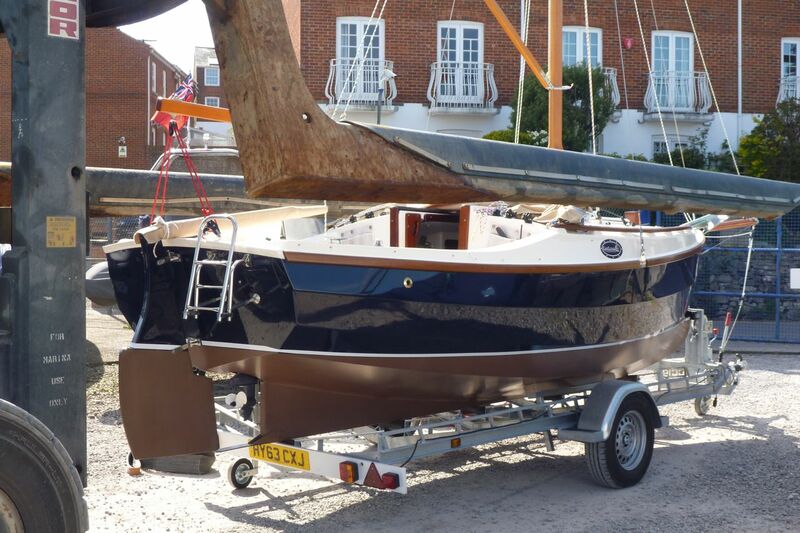 Nick & Suzy Scroggs are pleased to advise the continued production of the Cape Cutter 19 and the complete range of trailers. 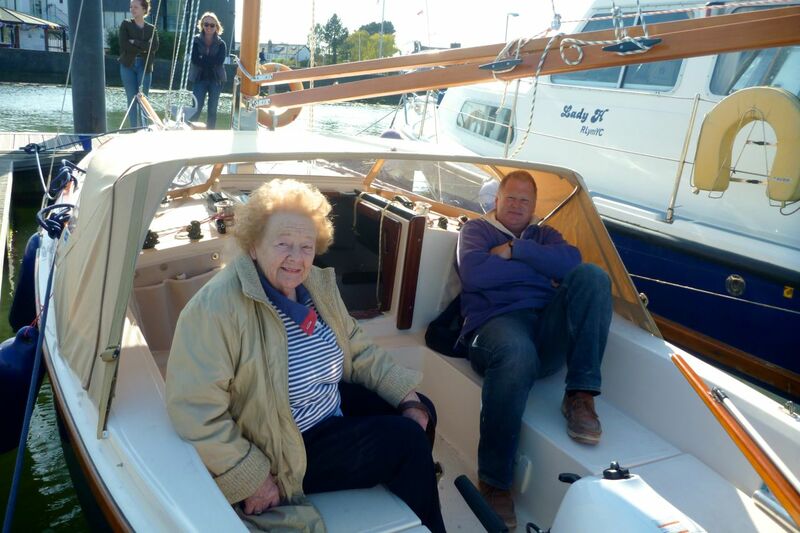 On their retirement in January Bob and Norma Brown handed over these 2 businesses to Nick and Suzy, who will continue to build this great boat to the same high specification. 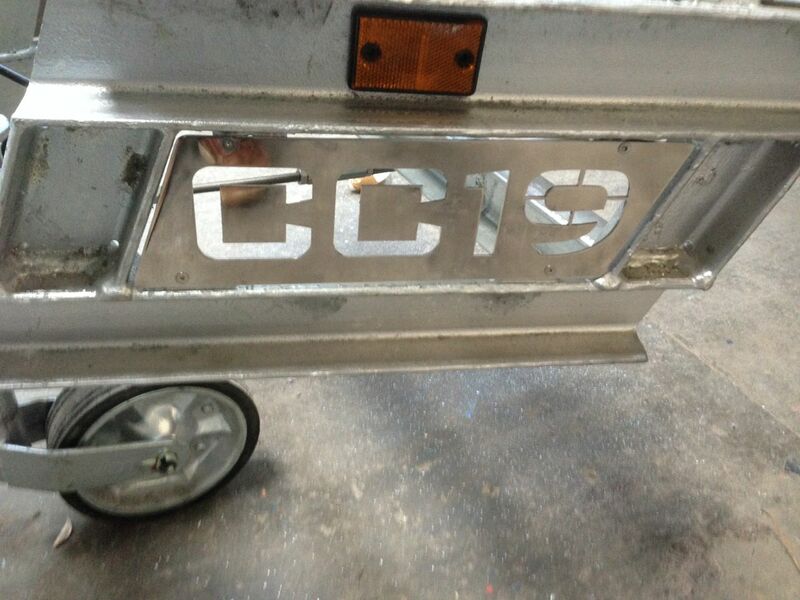 They will continue to offer an excellent service supplying all the spares for the Cape Cutter 19 and for the full range of trailers. 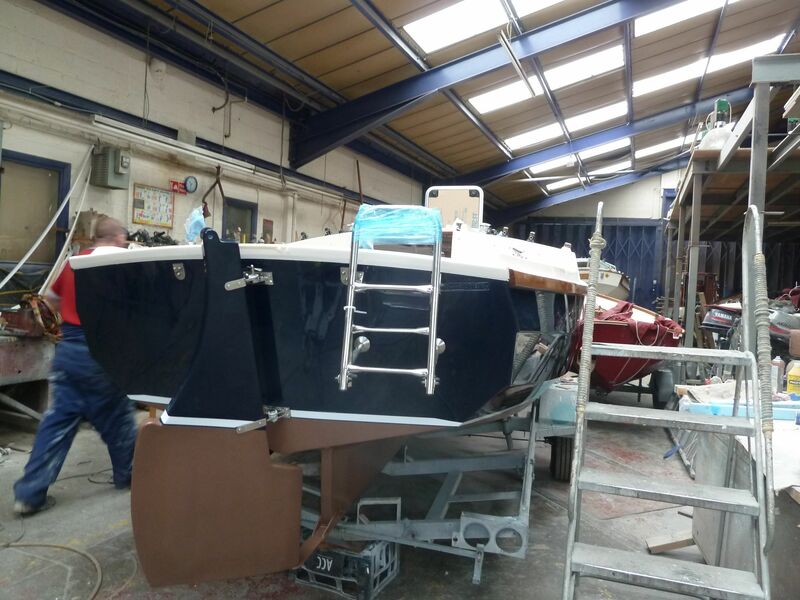 Nick is delighted to have secured the services of three of Honnor Marine’s skilled craftsmen, to help build the boats and the trailers. 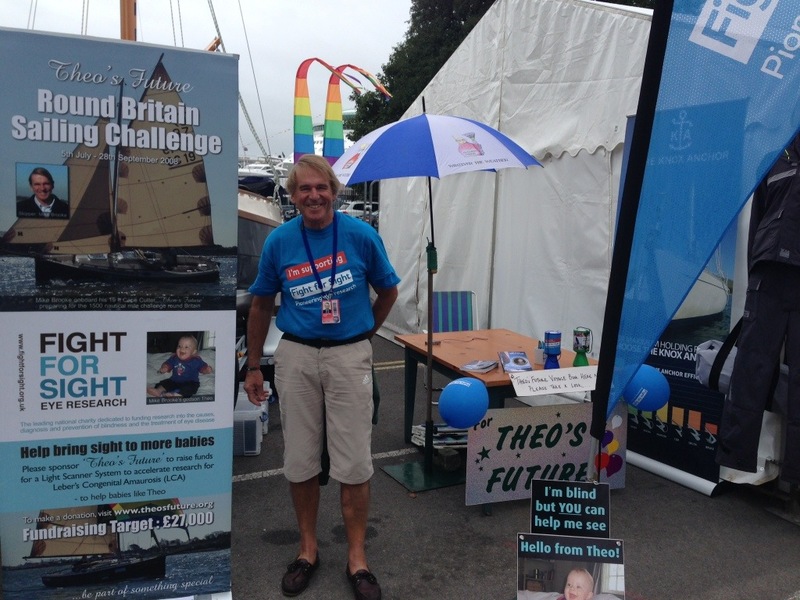 Nick grew up in Devon, started sailing when he was 8 and built his first wooden boat with his father when he was 12 years old !. He comes from a manufacturing background and is very excited about making and sailing Cape Cutters. 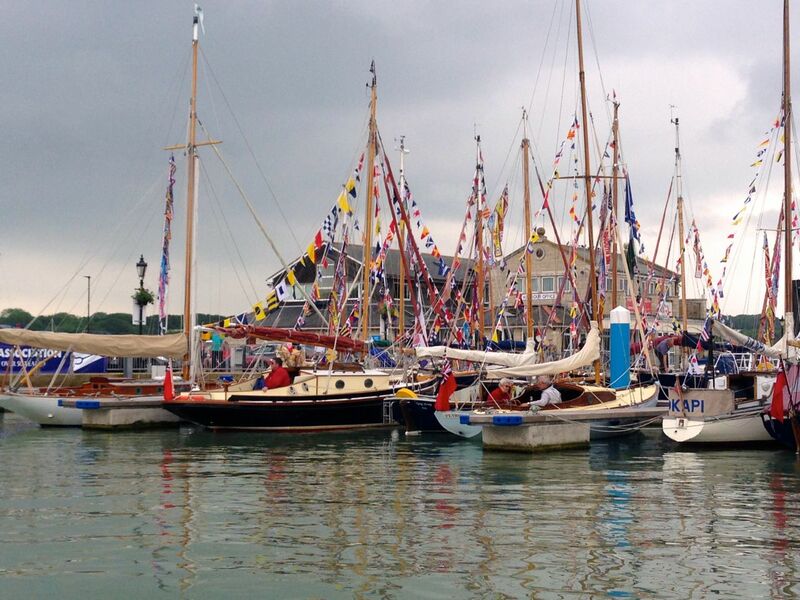 Nick and Suzy look forward to meeting and sailing with the association members during 2018. 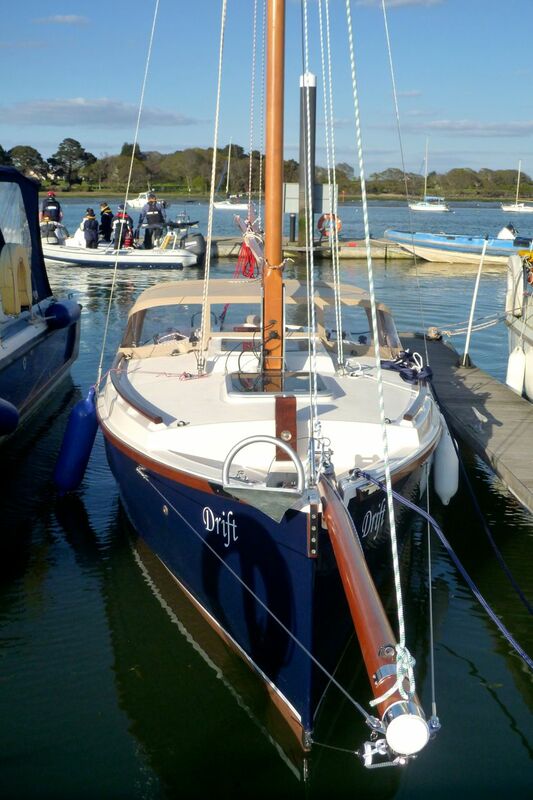 Drift has been sold and will soon be leaving her overwinter storage and heading to the lovely sailing waters of Falmouth. I had always wanted to get her down there as its home to many Gaffers and ideal sailing waters. It therefore seems fitting that her new owner lives in the area. This was the copper coat after a full season where weeding has been bad. A few small areas where weed has taken, but very pleased with the performance overall. Now its February and I have been repaired, its time to start preparing for the new season. The boat sailed beautifully, far better than it should for a 19ft gaffer and is surprisingly fast downwind. 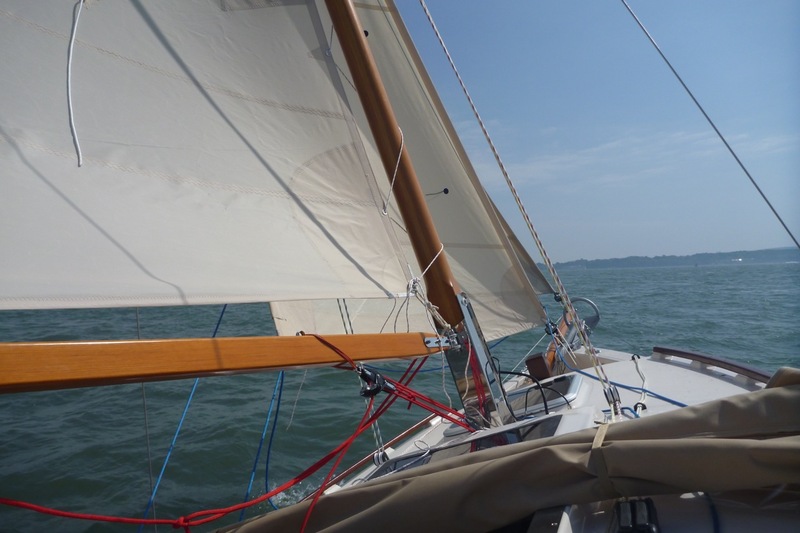 One more outing followed in late August with a good sailing friend. 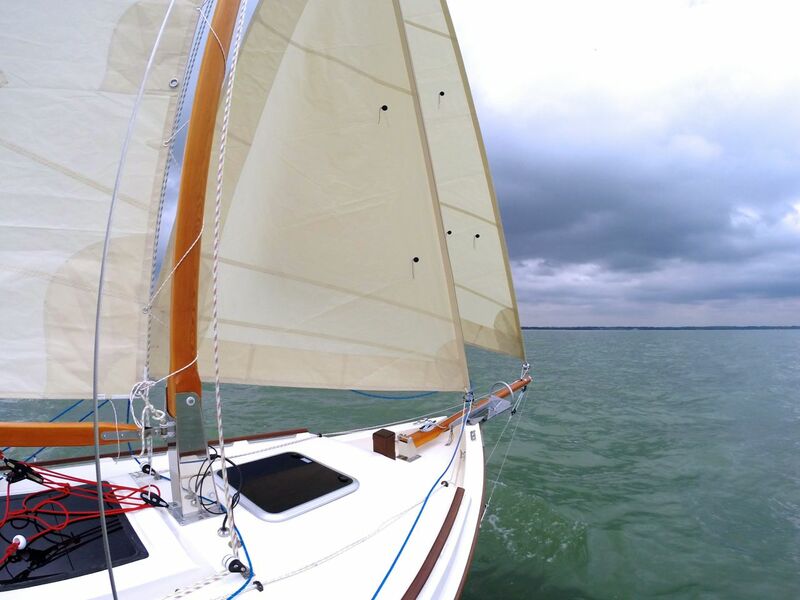 22-24 knots, one reef and a staysail and Drift remained stiff if a little wet and felt like a proper little yacht. Apart from the hatchway drains allowing some water below (always wondered why Mike Brooke put Champagne corks in his!!) the boat was excellent, driving through the steep waves and never seeming anything but very seaworthy. 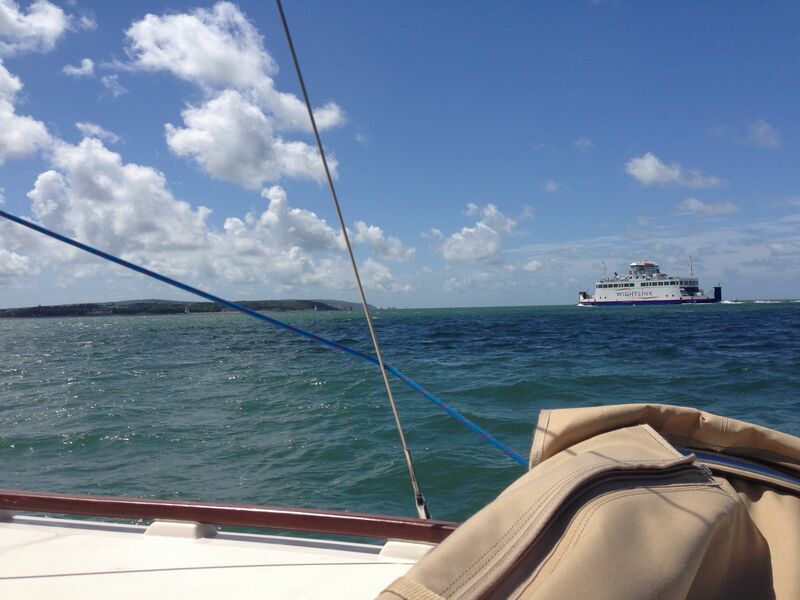 We turned downwind and the gps registered 8 knots slightly against the tide….. Unfortunately I paid the price of going sailing with a duff shoulder so my last sail of the season and a rather painful week followed consuming industrial amounts of ibrobrufen. The next 10 days will see an early trip to the winter barn for Drift and a trip to the hospital for a shoulder operation for me. Its sad to put Drift away so early, but hopefully I’ll be put back together and fit for next season. 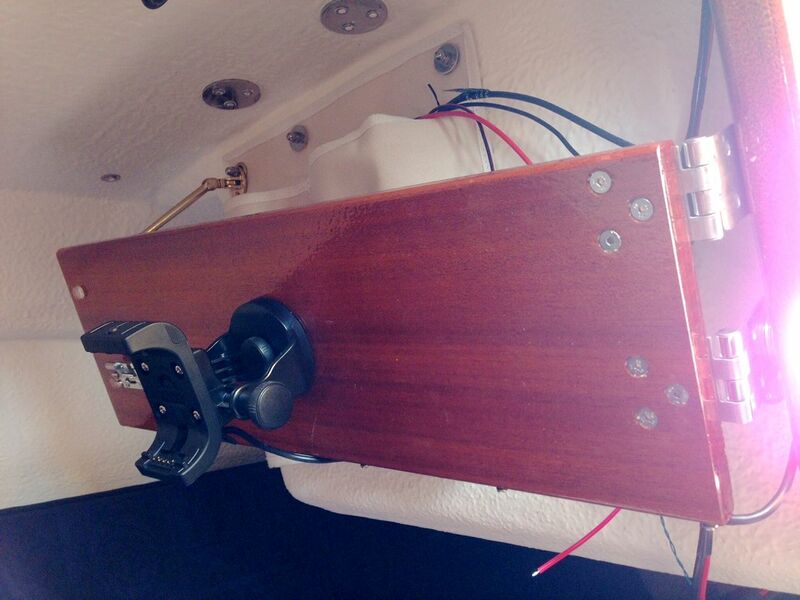 The board fits across the companionway and the bolt locks in place. 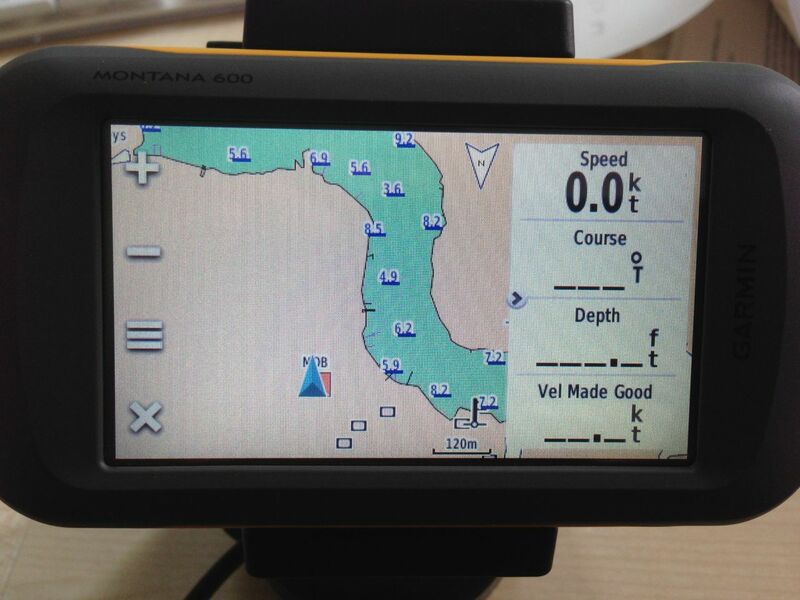 The Garmin Montana mount works well and feeds the depth from the intelliducer. The microphone is now mounted to the right of the Montana fitting . 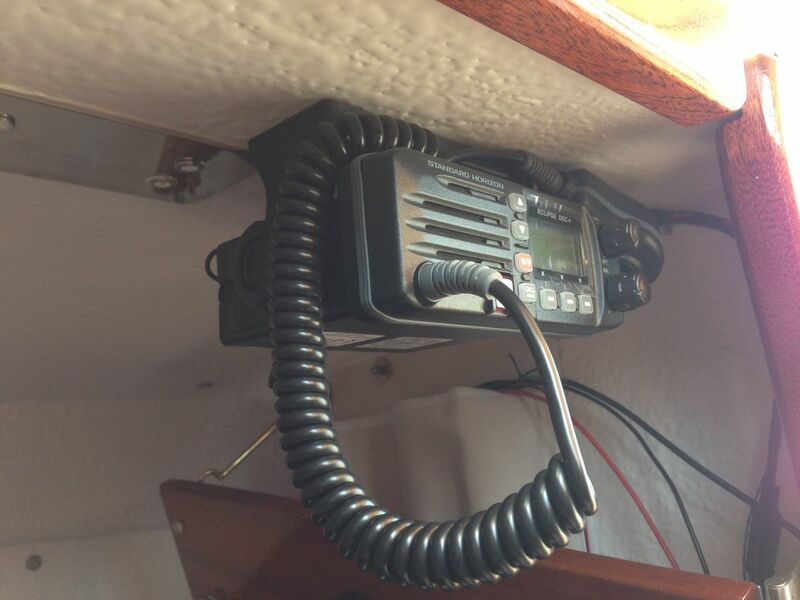 The VHF is screwed up into the roof with short fat screws and is rock solid. The mike now sits on its fitting on the board. The whole lot folds neatly out of the way. These ideas came from Mike Brookes boat and as with all of Mike’s tips, work very well. It was ‘Gaffers’ last weekend in Yarmouth and the previous day’s forecast had been for light winds, but not quite as light as they turned out….. 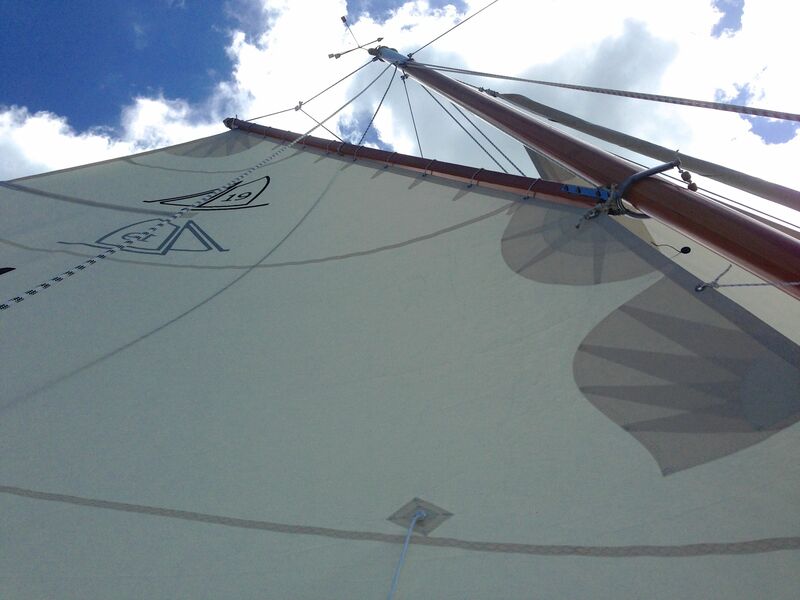 The sails are all now rigged and functioning correctly. They look great, but as shown by the telltales the wind just kept dying away and the cloud cover had killed any sea breeze, so there was hardly a breath. ‘Drift’ living up to her name !! 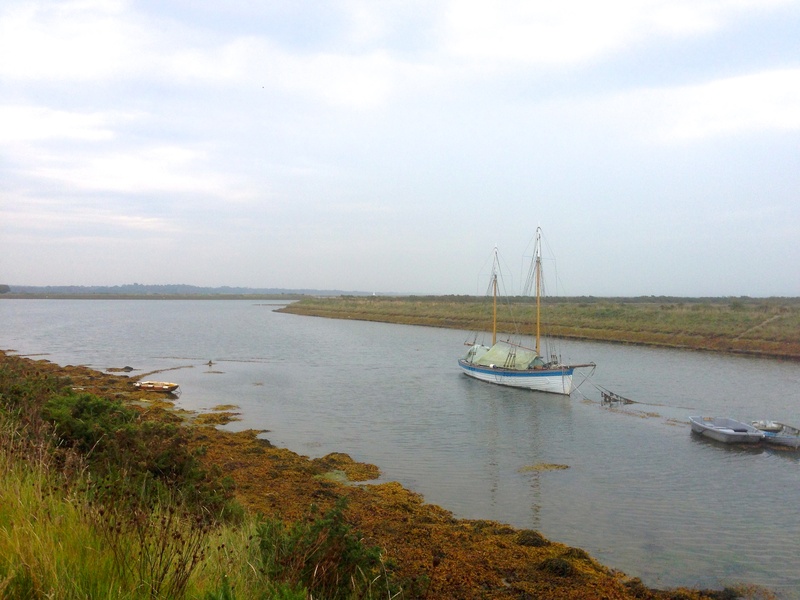 Finally we gave up trying to sail to Yarmouth as the ebb tide was building, so we fired up the outboard and motored over. We were not planning to stop this year and it did seem to have a few less boats than the last year – perhaps put off by the forecasts. 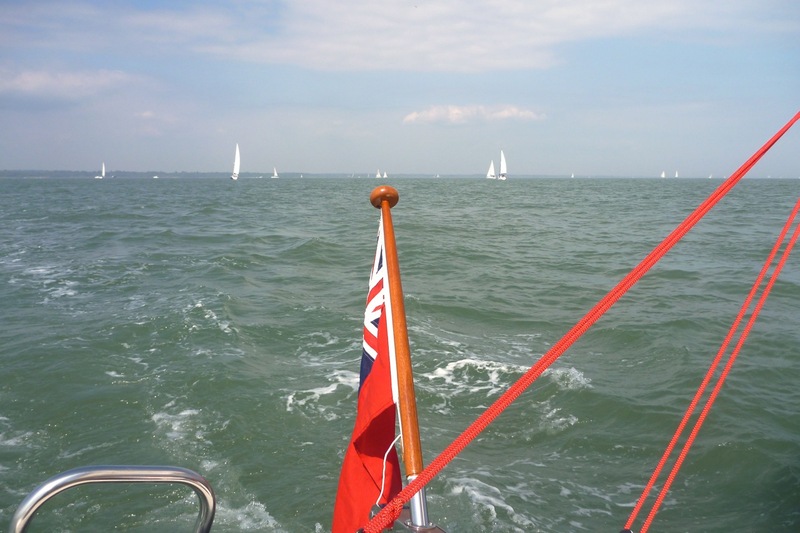 Our best efforts to sail back on a strengthening ebb, was carrying us more and more towards Keyhaven. Eventually I had to concede defeat and the motor came in to play again. I have been experimenting with tightening and lengthening a number of lashings and slowly we are getting there. I definitely need to add some sort of outhaul setup and add a mast strap to keep the sail close to the boom when the outhaul lashing is lengthened. The instrument panel needs fitting so I can test the instrument placement and then remove it for a few coats of varnish. Sails all present and correct and a sea breeze on Saturday was a chance for a first sail for my wife and I. 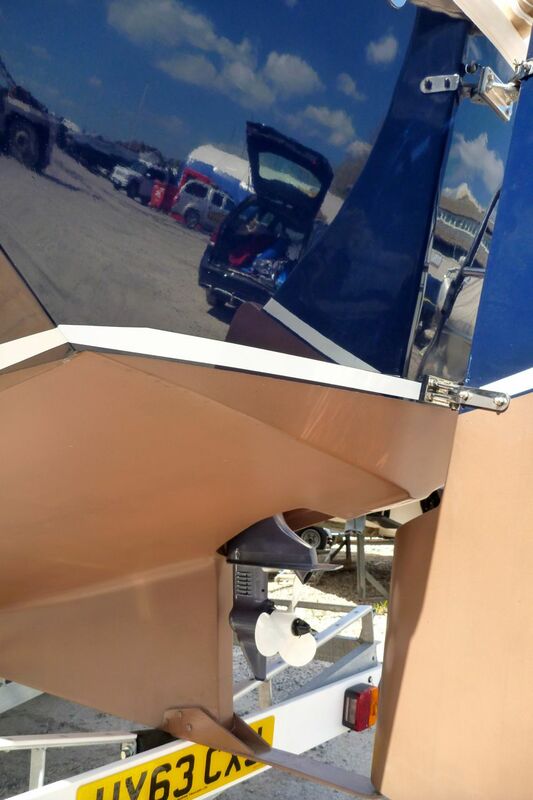 The engine arrangement works well allowing the outboard to turn and make reversing much easier. 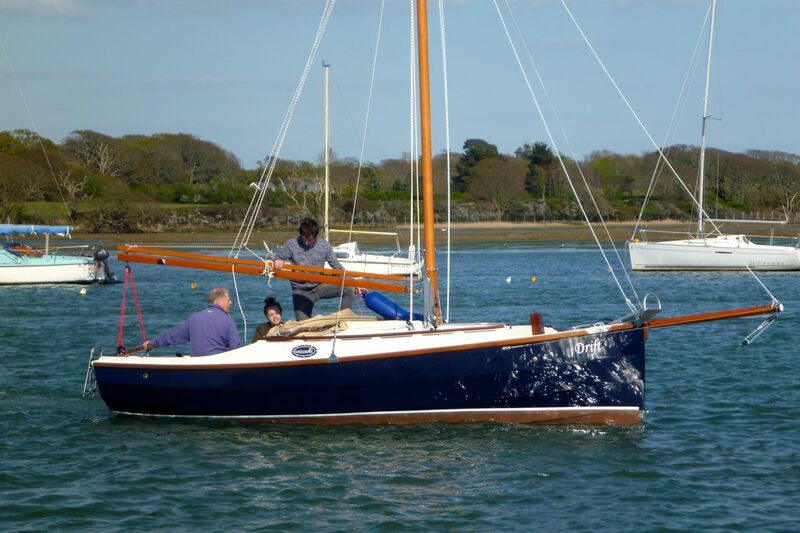 The beauty of the gaff rig is the ease of raising and lowering, which together with twin furlers means there is little hassle or stress in the sailing process. My wife certainly approved! 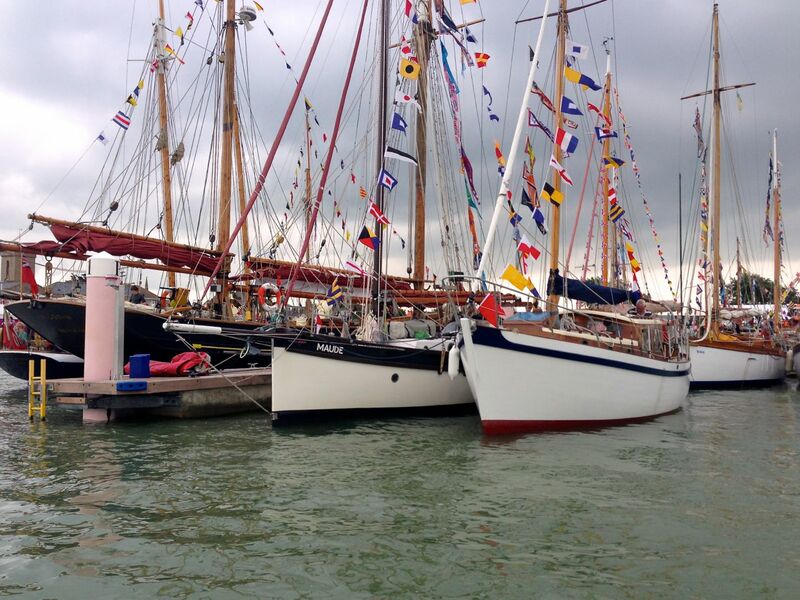 Started with Staysail, Yankee and Main and Drift cracked along nicely. As the breeze built I rolled away the Yankee and the boat became more docile, but lost little speed and she went to windward well. 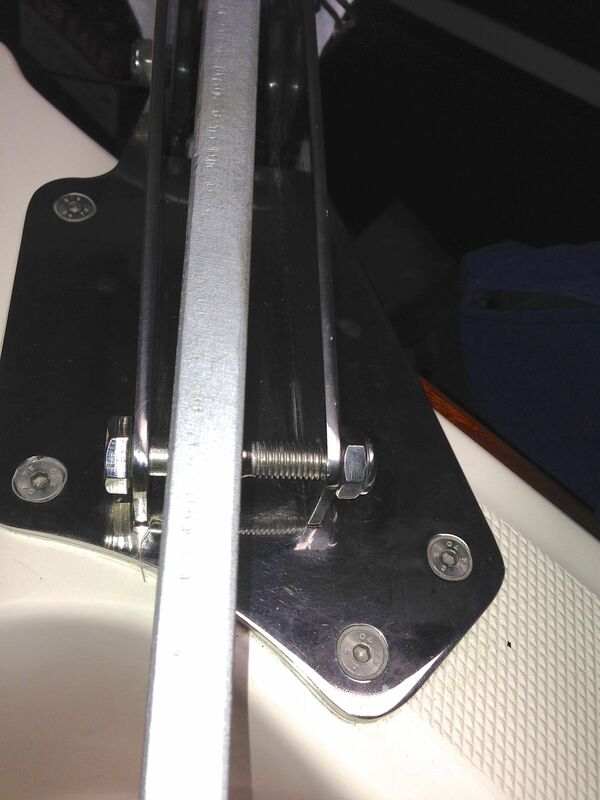 The peak halyard has a big effect on setting the main and needs adjustment on each point of sail. when we decided to bear away, rather than go dead downwind, we rolled out the Yankee and tended to keep both headsails driving. 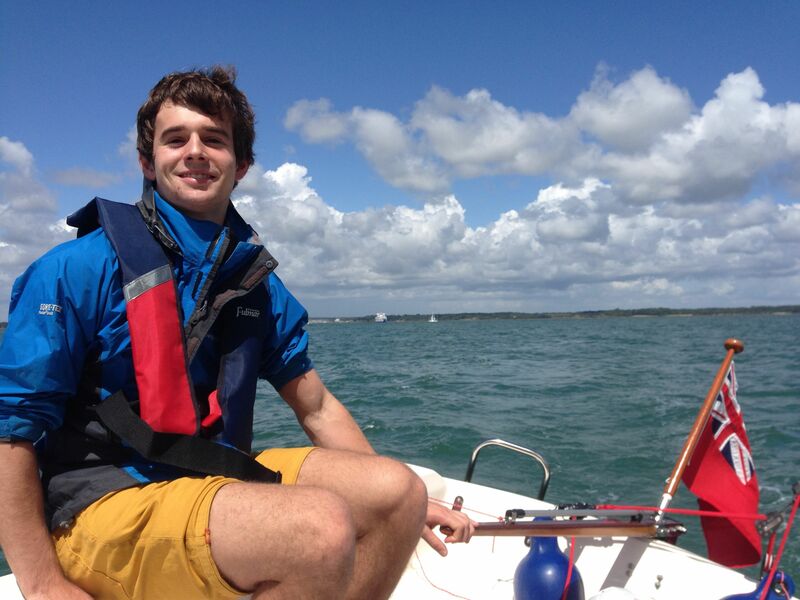 Drift made very good speed downwind, fighting a strong ebb tide with little problem. The sailing performance is very good for a boat of this size. The boat remains stiff in a breeze and it cuts through chop really well, with no slamming, which is impressive. 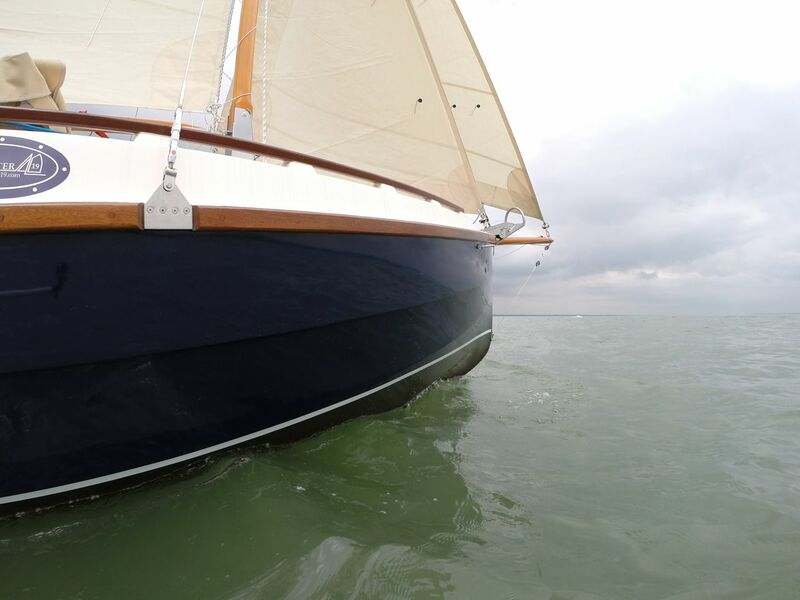 Whilst there is a some tweaking around lashings and the like, it was a good first sail, short, but showed the sailing ability and the stability of the boat. This feels like a boat that is capable of some great adventures. 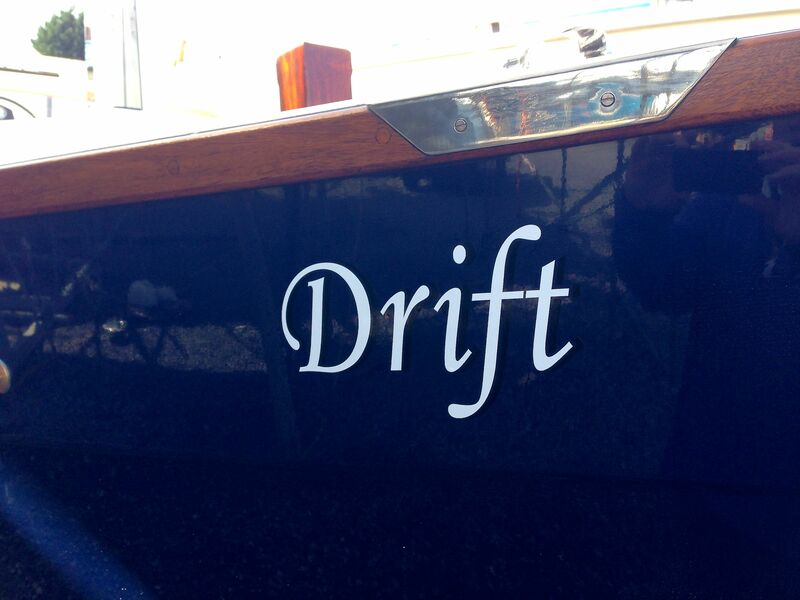 Finally, we got the chance to christen Drift properly. 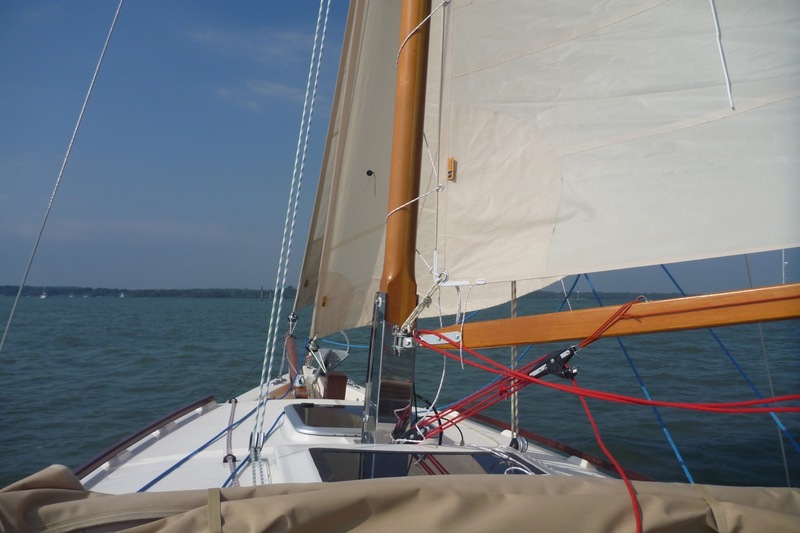 A few drops of champagne over the bow……..
Last Saturday, we bent the sails on for the first time and it became pretty obvious that the torsion line in the staysail was not stitched in to the stay sail, so it hoisted like a crinkly bag! We still went out in light airs and learnt a number of things. The Parrell beads need to be tied reasonably tight or the gaff prongs can move around. The lacing on the gaff can be continuous, but the line supplied was about a foot short! The supplied reefing lines are far far far too long. 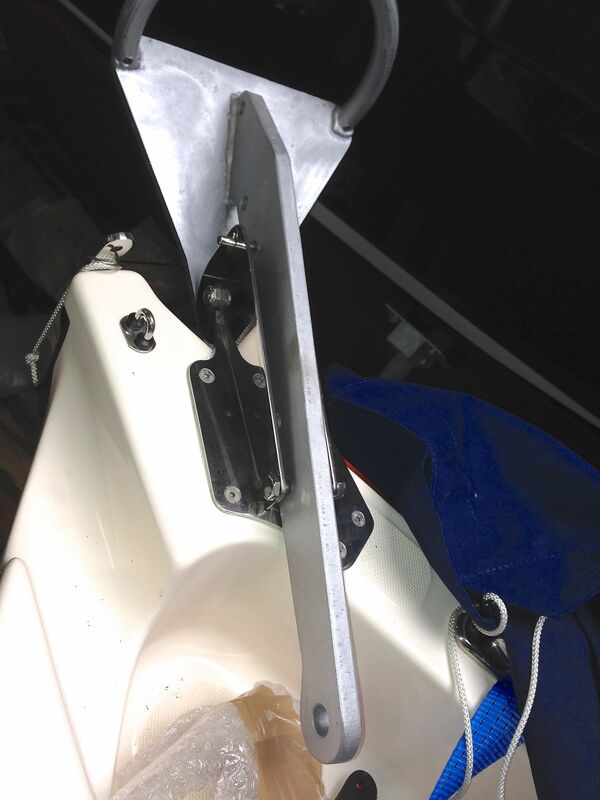 The gaff halyard attachment has to be a solid knot in the middle or the gaff raises very crooked. So, a gentle sail with no staysail was undertaken before motoring back in. Damage was a few scratches on the mast, but when I have time I may try and drop the mast on the water and touch up. The staysail was dropped in to Hydes who did a great job of turning it around quickly, but 30 + knot winds this weekend have kept Drift in her berth. Friday was finally the day to get Drift on the water. 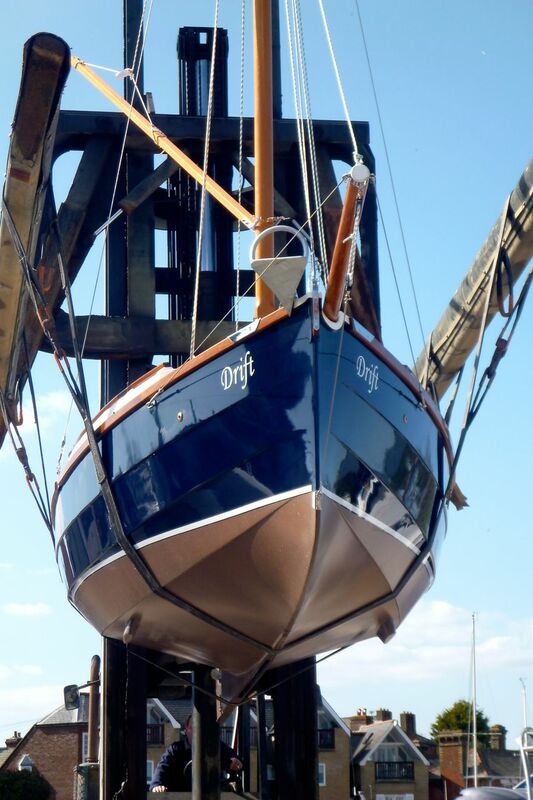 Once the boat was moved to the yard I started the rigging process. The manual together with having seen other boats makes it reasonably straight forward although it takes a fair amount of time. 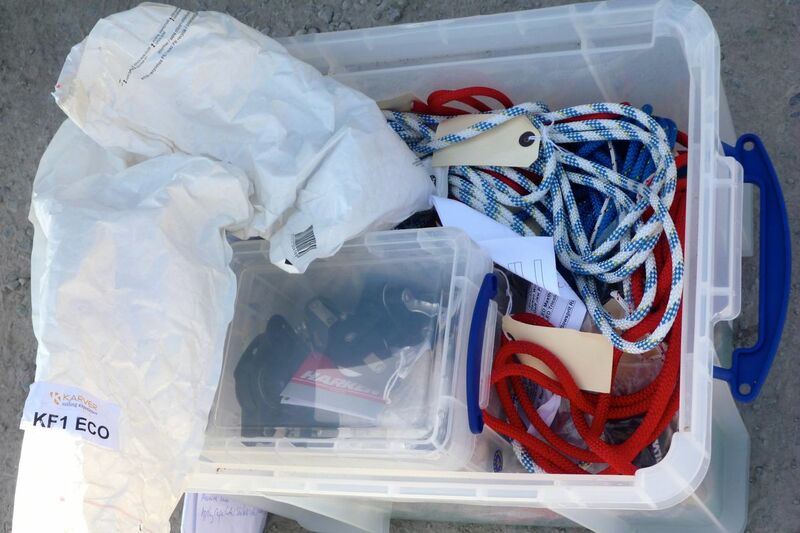 Honnor Marine provide a box of bits, all neatly labelled. Having opted for different furlers on both headsails, a few more bits are required, but the time flew by and there wasn’t time to bend on the sails before the launch time. 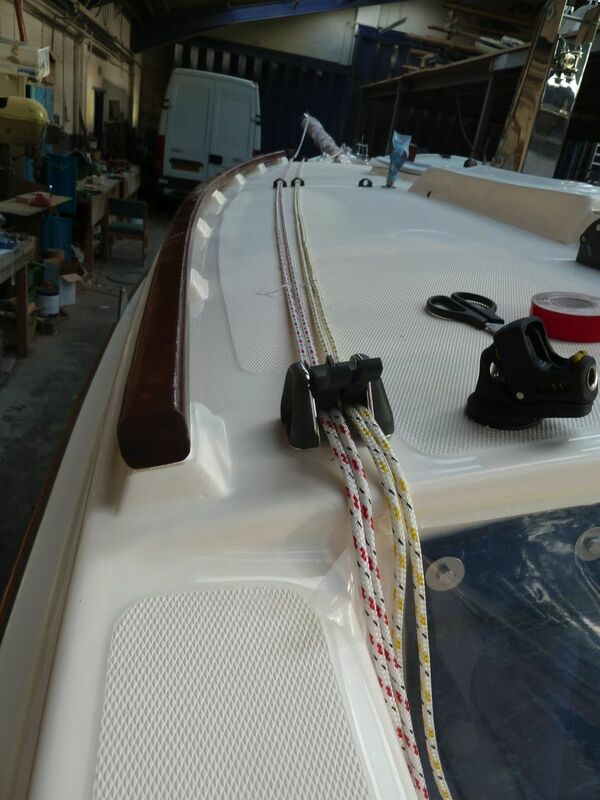 The halyards and stays all need laying out and blocks fitted and where appropriate split pins taped. 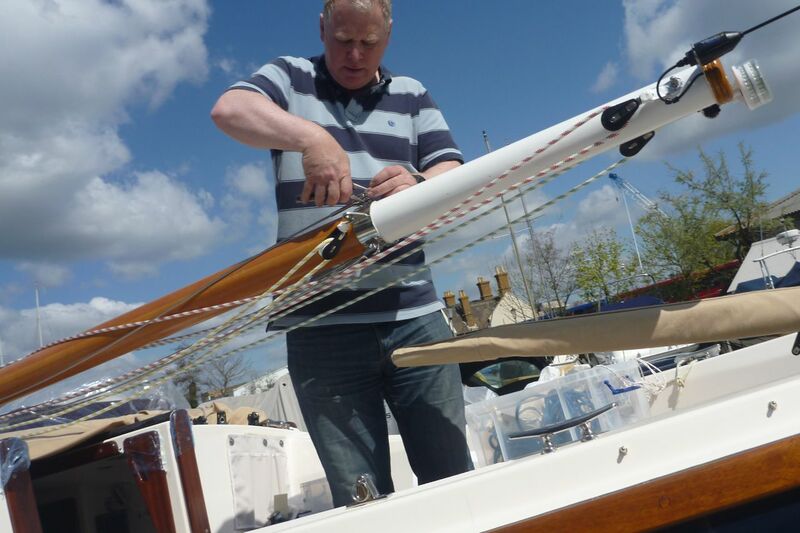 The Foresail halyard blocks were not supplied with twisted shackles and the bowsprit stays need bottle screws rather than the lashings supplied, but only one trip to the chandlers whilst rigging a new boat shows that the box of bits was pretty comprehensive. The engine was dropped in and needed raising a pin to make sure it doesn’t touch the hull. It sits nicely, well immersed, but right behind the keel. It also allows the motor to be turned, which is particularly useful in reverse. 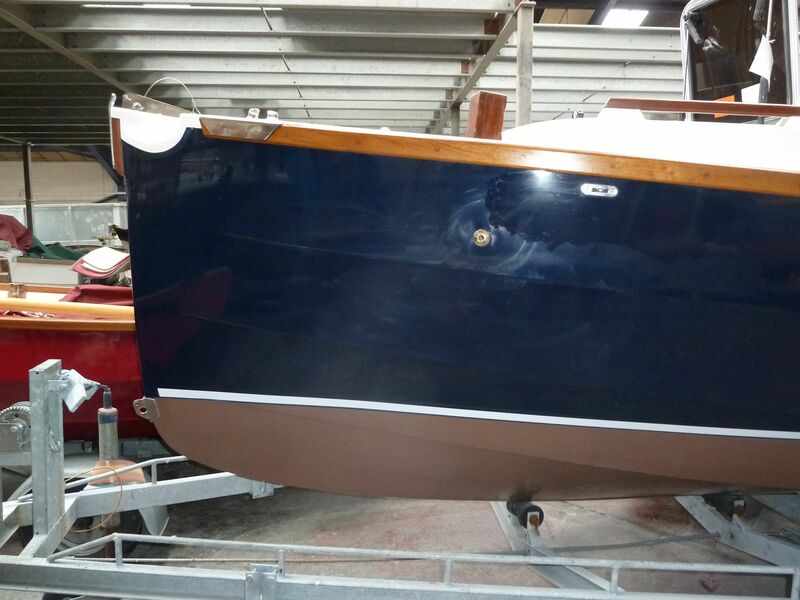 It will need antifouling in th next few weeks, now the level of immersion is clear. 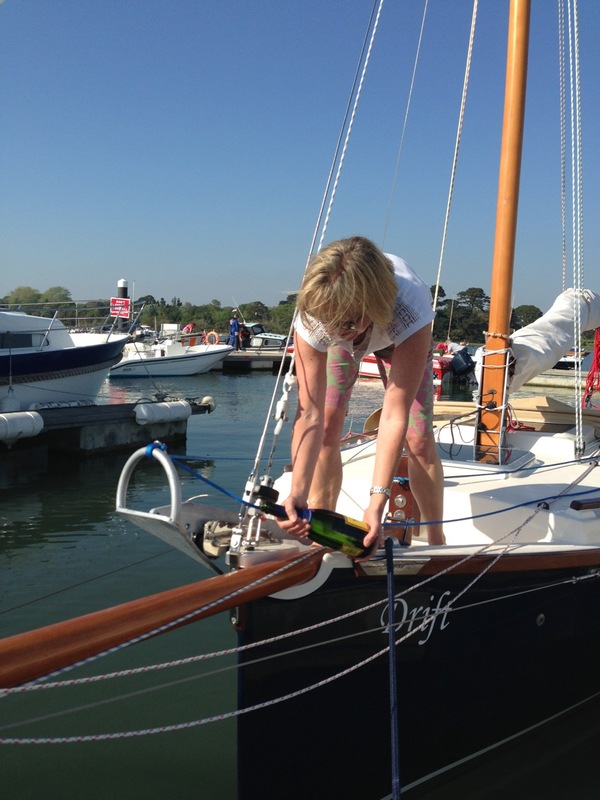 Time for launch, spars all up and secured, gaff and boom on……. Love this shot, really shows off the hull shape. 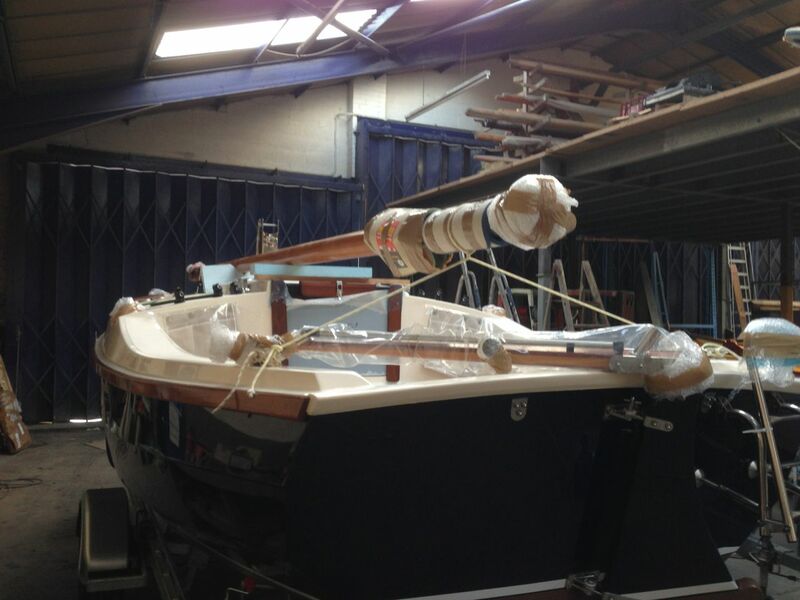 And there she is, afloat, looking great, just needs some sails and a clear day.. 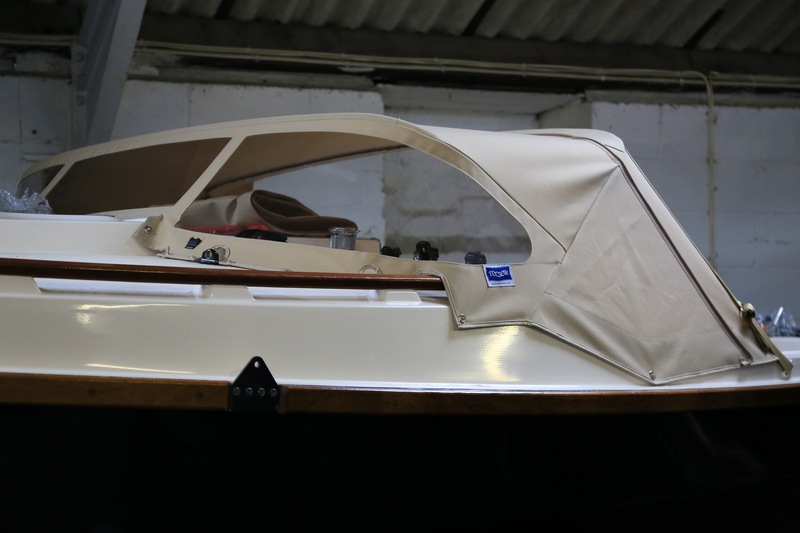 The spray hood from Tecsew is now fitted and it looks great….. 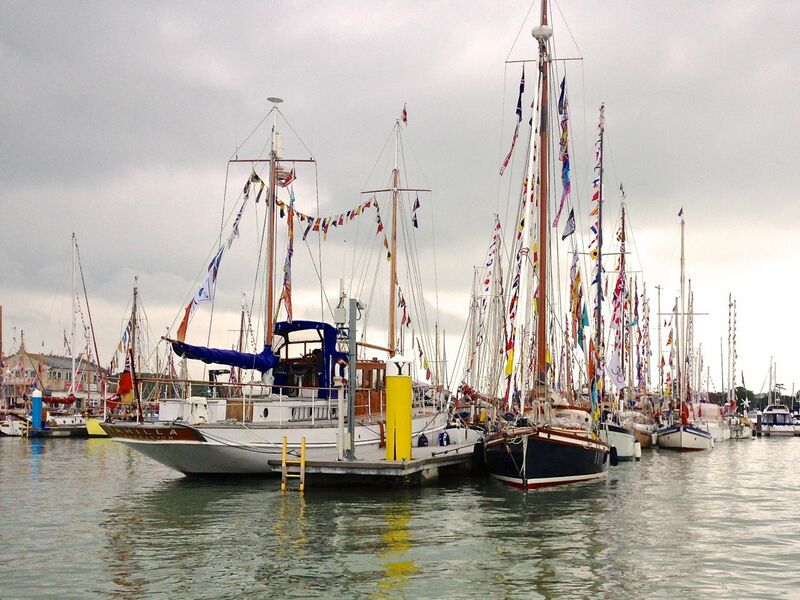 Here is Drift packed in between the folkboat fleet. 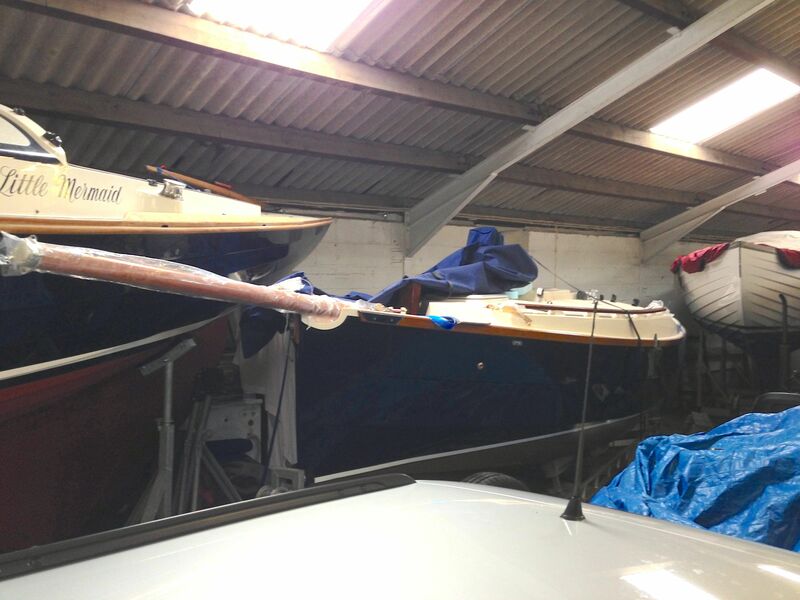 I attached the bowsprit this weekend and it doesn’t clear the roof so you realise that it really is quite long! I need to find some bottle screws for the stays as the supplied lashings allow too much movement. 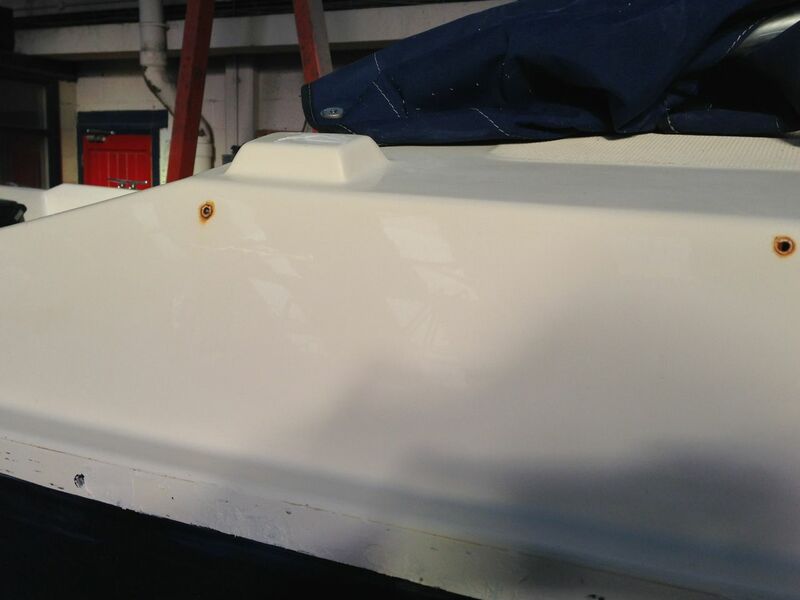 As the hull is coloured I also gave it an overall coat of UV polish to try and stop sun fade on the topsides. I also tried the anchor fitting. There is a simple locking pin at the bow. with the end of the anchor simply bolted through to a Nylock nut. I am not sure that is the best way of securing it as the nut could easily go overboard if there were any waves bouncing you around. It will also rattle around a lot, but like others I have used some pretty rigid hose as a spacer to hold the anchor securely. 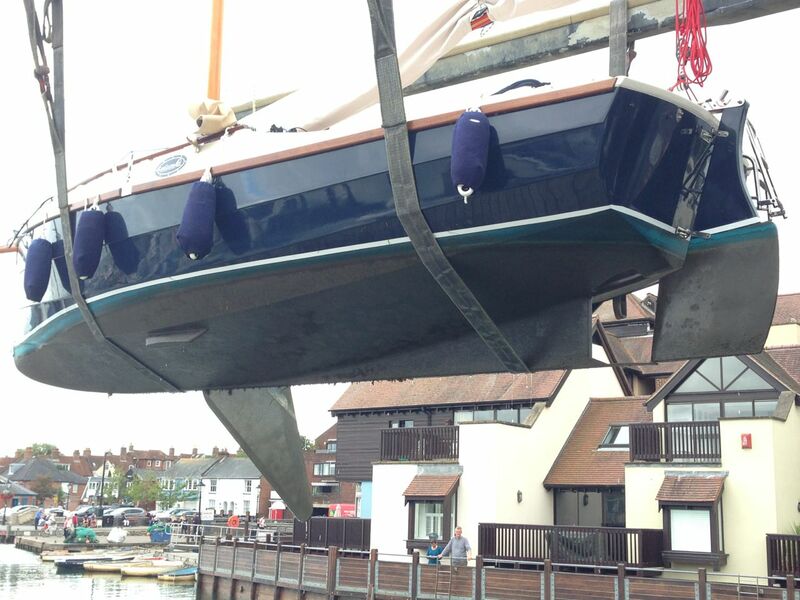 The mooring bill arrived this morning, a nice sobering thought and time to kick on with a few more bits. The cockpit tent and sprayhood are being fitted in the next couple of weeks. 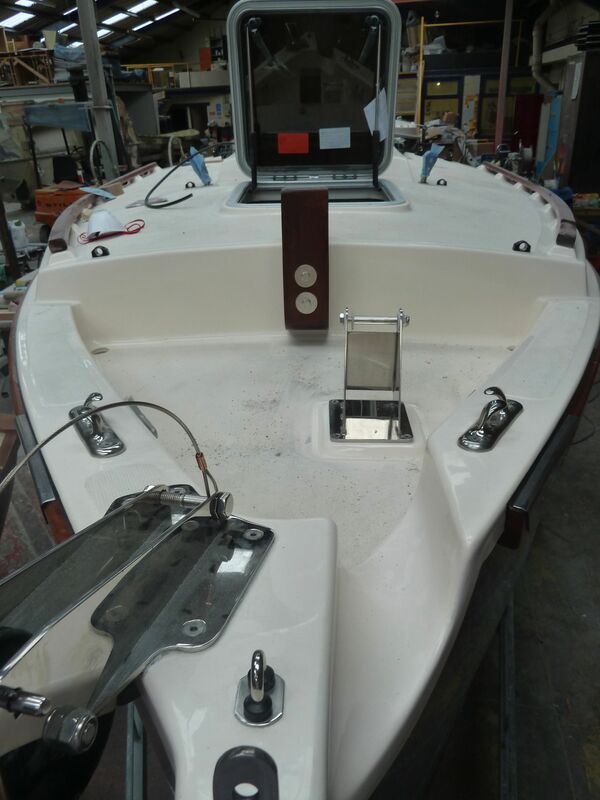 A few more bits have been crossed off the list, Silva Compass, Stove, 10 Watt Solar Panel and a brilliant collapsable washing up bowl from wackypracticals – nothing better than saving space on a small boat! 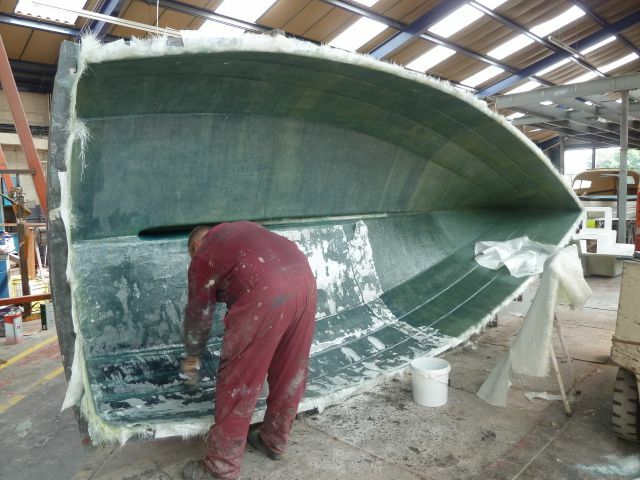 This is a new boat in build and not far away from being finished – in theory its hull number 122. 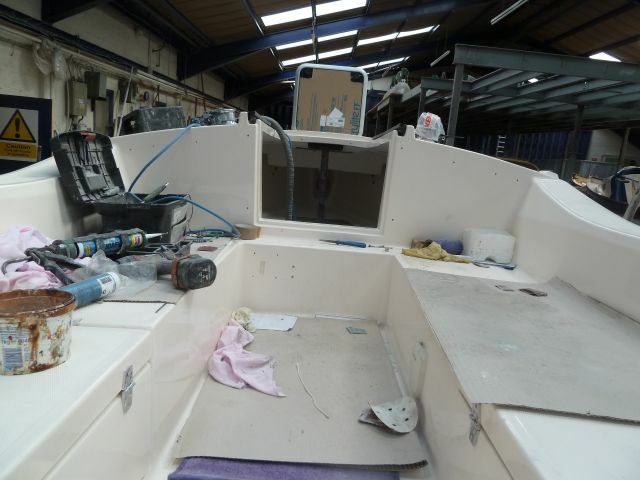 The second boat was Hull Number 56 ‘Foxglove’ which has just been bought by Colin and Randi McDougall and is having a thorough smarten up. 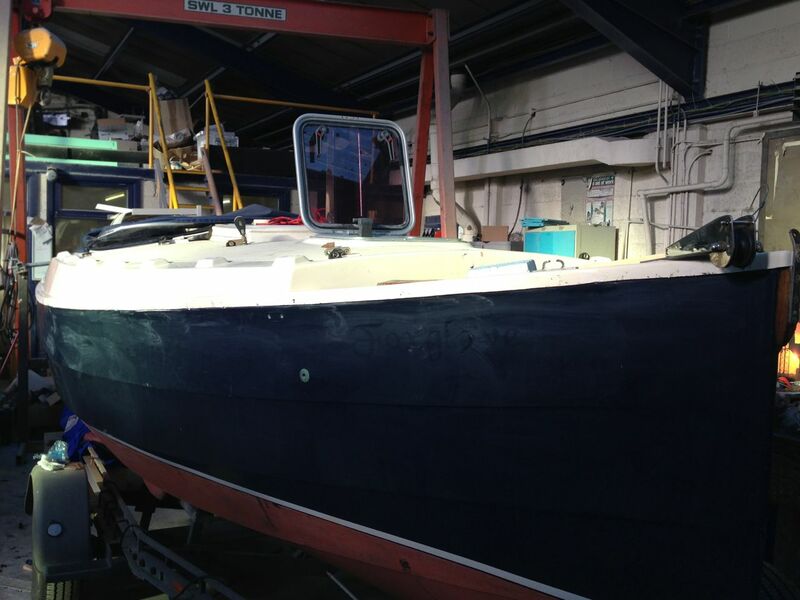 As you can see the rubbing strake and the handrails have all been removed. At last the waiting is over and I headed North on Wednesday. Having spent the night at Oldhams finest (?) Premier Inn, I arrived nice and early to collect ‘Drift’. I was able to have a look over her before everything was packed inside for the journey home. The interior is nicely finished. 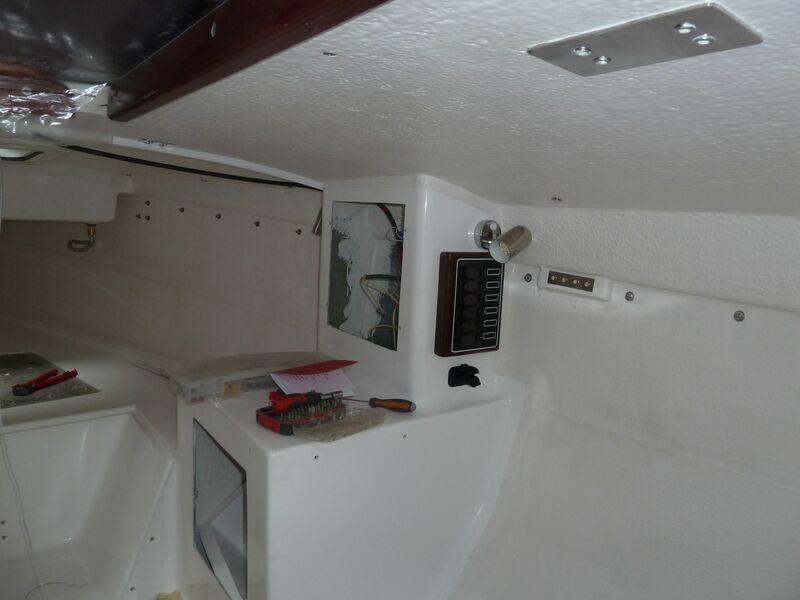 The lights are not the standard LED strips, but two pairs of LED lamps on either side of the cupboard mouldings and a 5th Dome light over the forepeak berth. I think they work really well and are more in keeping with the boat. The forehatch is has a clever double blind arrangement built in with an insect net if pulled from one side or a blind if pulled from the other. and then removed to show the additional flexteek and mounting for the table. 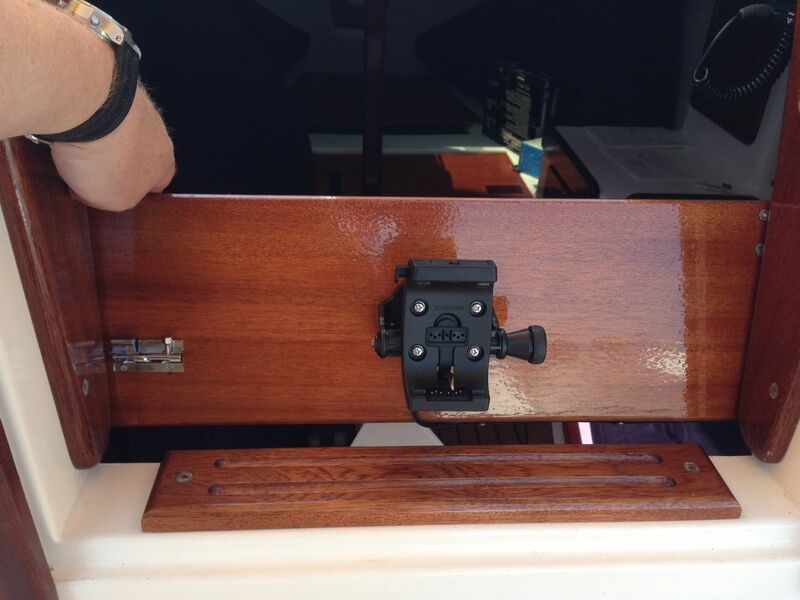 The second cockpit mount for the table can be just seen next to the tiller. Then the time had come for her to see the light of day. And ready for the off…. Bob kindly led me out of Rochdale and on to the appropriate Motorway, which was very considerate. I had 270 miles to cover at 60mph before the traffic delays – which were pretty horrendous until I was clear of Manchester! 6 hours later and in the dark, I dropped her off at the storage barn. The Honnor marine trailer is really excellent, tows and brakes very well. I need to work out the best way of securing for towing once she is rigged, but that will have to wait a while. So Drift is now built and here, so its on to the next list of bits to add! Whilst it was disappointing to miss the last half of the season, I now have a couple of months to finish off and be ready and raring to go in the spring. 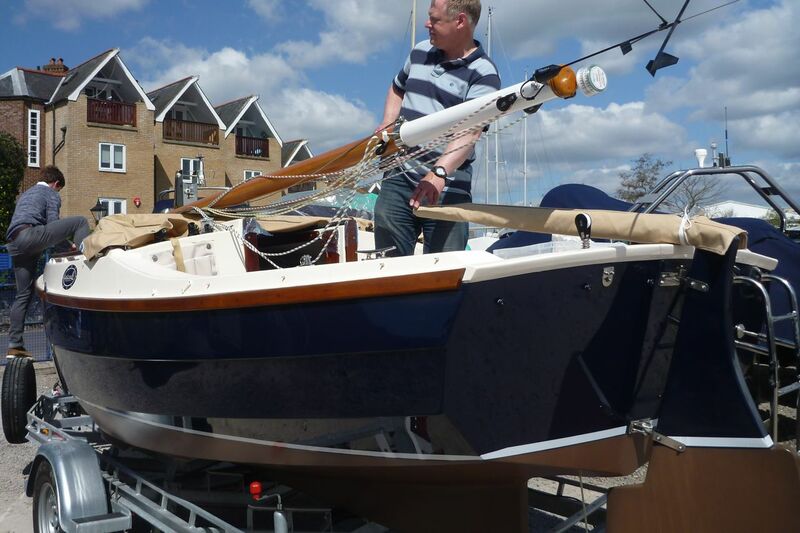 Weather permitting I will be setting out this Wednesday on the 520 mile round trip to collect our new boat and bring her home. The last minute preparations such as the final payment transfer, insuring the boat and trailer, checking that my car insurance has the right cover, booking a hotel, filling the car, packing additional straps, finding the wheel clamp and last but not least booking a Premier Inn! Quite a few menial things for such a basic task! 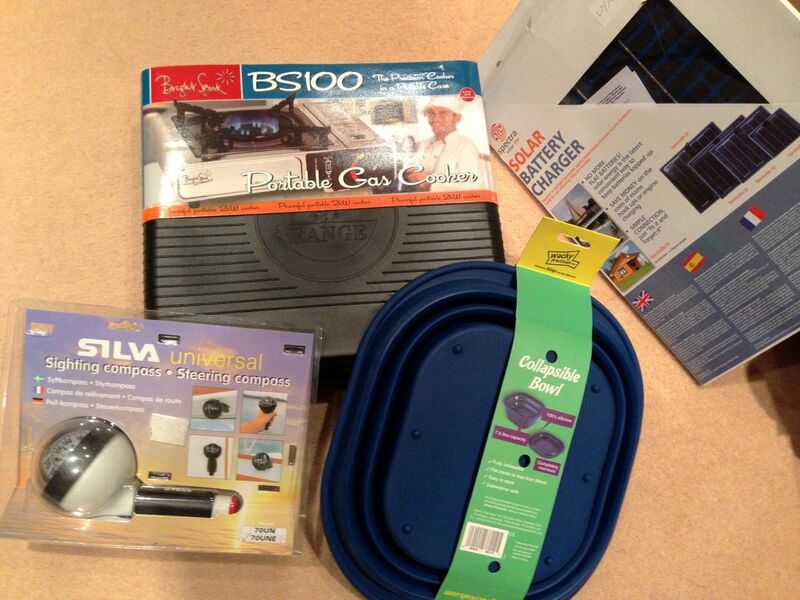 I haven’t collected the boat yet, but I was able to collect the auxiliary power this weekend. 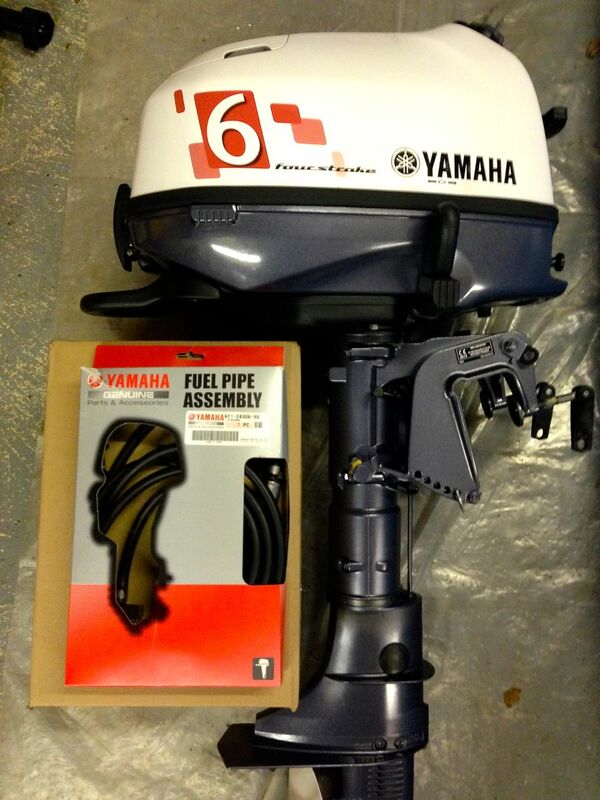 A 6hp Yamaha with tank and fuel line. I am sure 4 or 5hp would be enough for the boat, but as they are all identical in size and weight, I chose the 6 especially as there was such a good deal available at the boat show. Yamaha is supplying the same engine with a grey lid for 2014, so the identical 2013 engine with a white lid ended up being over £300 cheaper…. For power I am planning to use a solar panel with occasional mains top up to start with, so haven’t had the charging coil fitted as the engine will be used for relatively short periods. 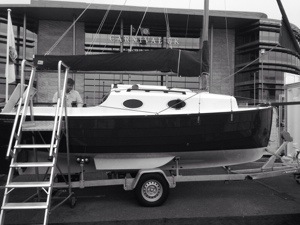 The boat is now complete and collection booked for two weeks time. This shot shows the finished interior with a couple of changes from the standard specification. 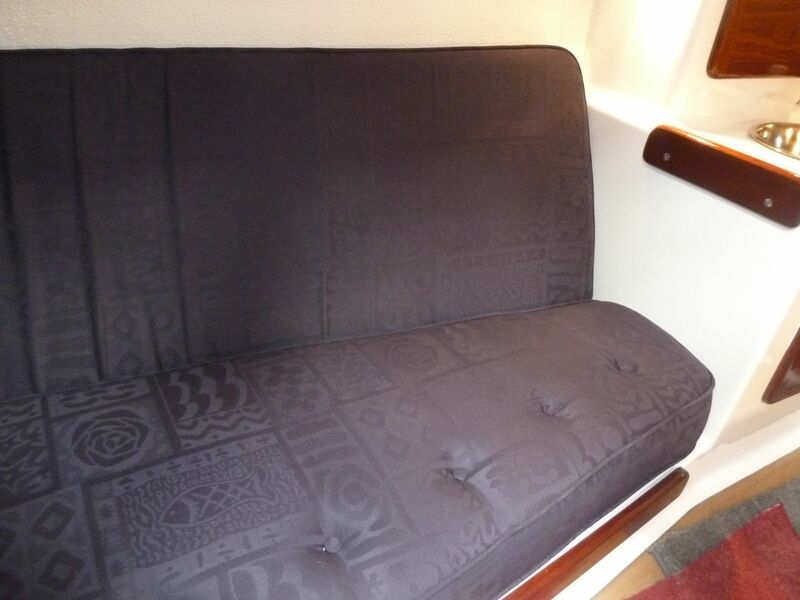 Firstly the upholstery is not standard and the cushions are 5 inches thick rather than the standard 3 inches. This was a tip from Mike Brooke and I think we will all appreciate the additional comfort when on board. The lighting would usually be 4 strips of LEDs, but I prefer more traditional lights, so there are 4 individual lamps – still LED’s plus a bulkhead light over the forward bunk. 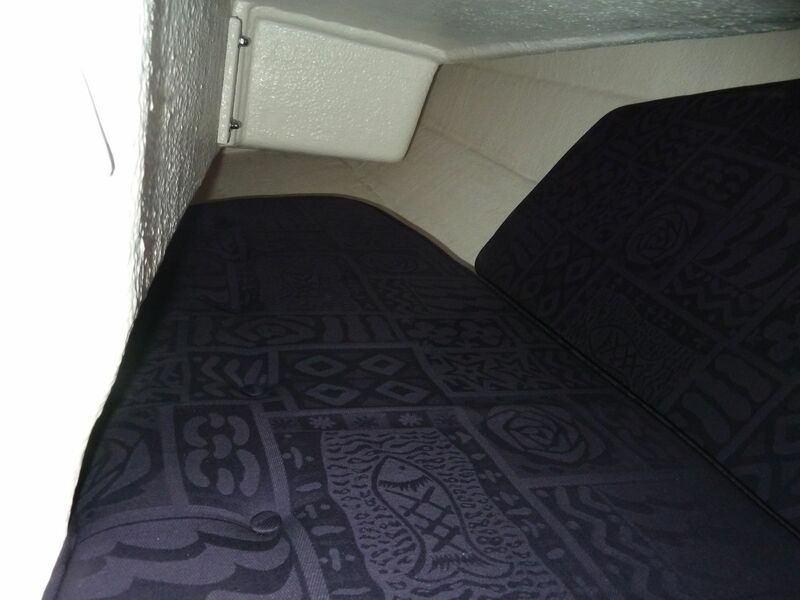 The buttoned roll is to create an edge to the bunk. 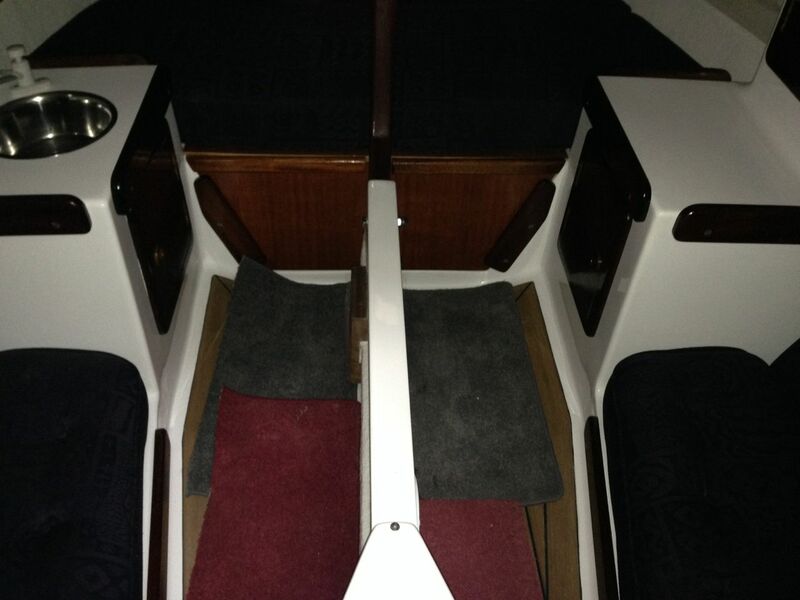 You can just see the edge of the flexteek which is on the cabin floor. 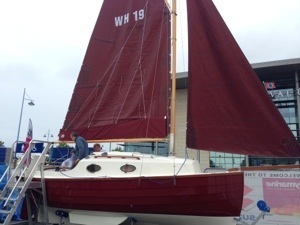 The noises from Lancashire are suggesting that Cape Cutter 19 sail number 121 is now complete! The positioning of the furler lines remains undecided as I have concerns about friction in the proposed system, so want to play around with a few options before committing to final fittings. The build has taken quite a bit longer than originally expected. It means that with Christmas looming and a good deal of forecast wet and windy weather still to come in November, its first trip is going to be into the local barn. 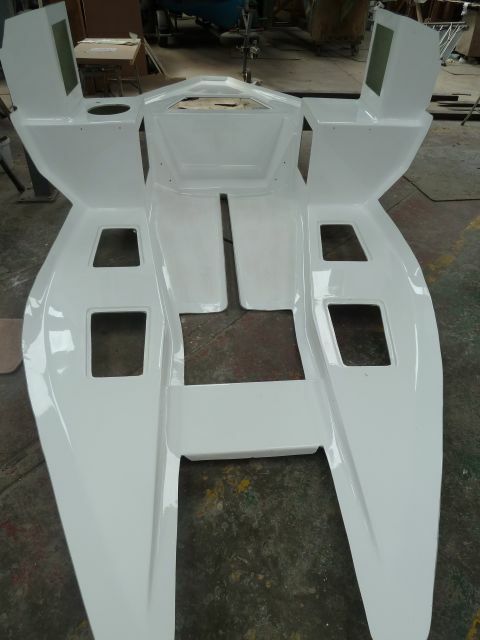 We still have to fit instruments, collect the engine, stove, locks, VHF, fenders, safety equipment and get the spray hood and cockpit tent made and fitted – so plenty to do. The final action will be to get the name sign written. 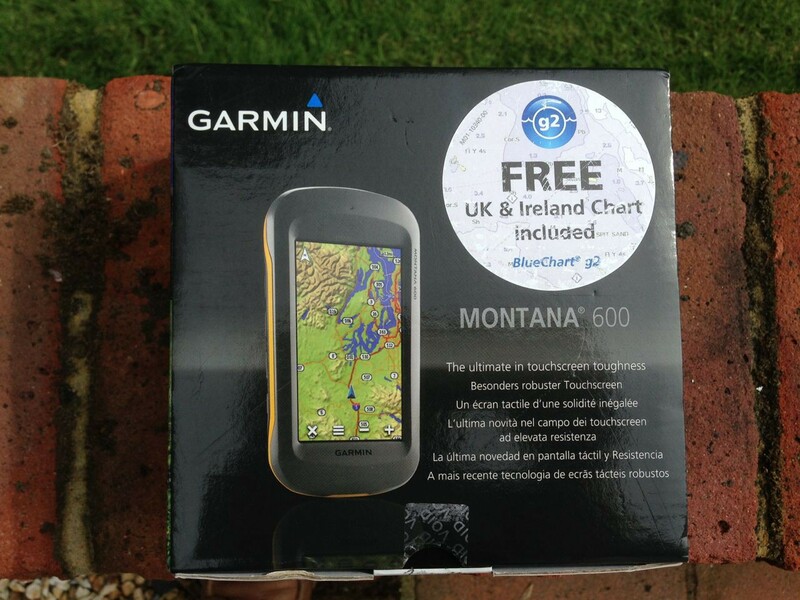 these work on a continuous line basis so cannot jam and are used on the mini transat boats so they are more than up to the job, but they come with a wealth warning…. The lines are possibly going to be laid out like this although there are some concerns about the friction of having two quite thick lines running through single bulls eyes…. Subsequently we have decided not to use this layout. There certainly will be friction with the sharing of bulls eyes, but reason we have changed is the location of the jammer. to operate them you will end up kneeling on one side of the boat and pulling from the edge of the boat. This is very unbalanced and controls are better if you can stand up straight and operate them centrally without unbalancing the boat. In addition you can guarantee that someone will be sitting in front of them at the very time you want to get to them! 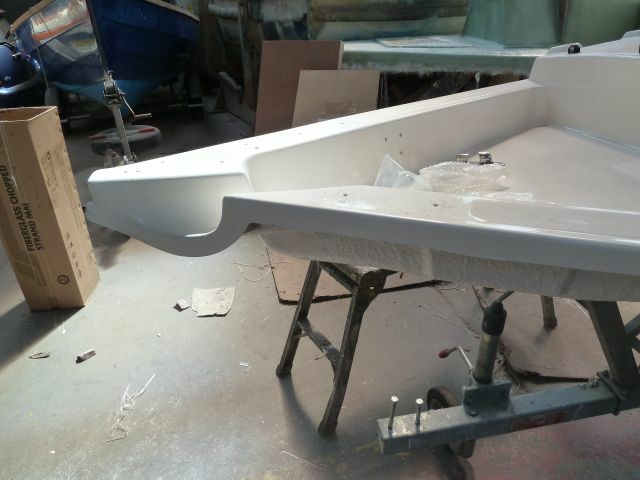 Instead the lines will be led back to simple cleats either side of the hatch and lifted and operated direct when needed. 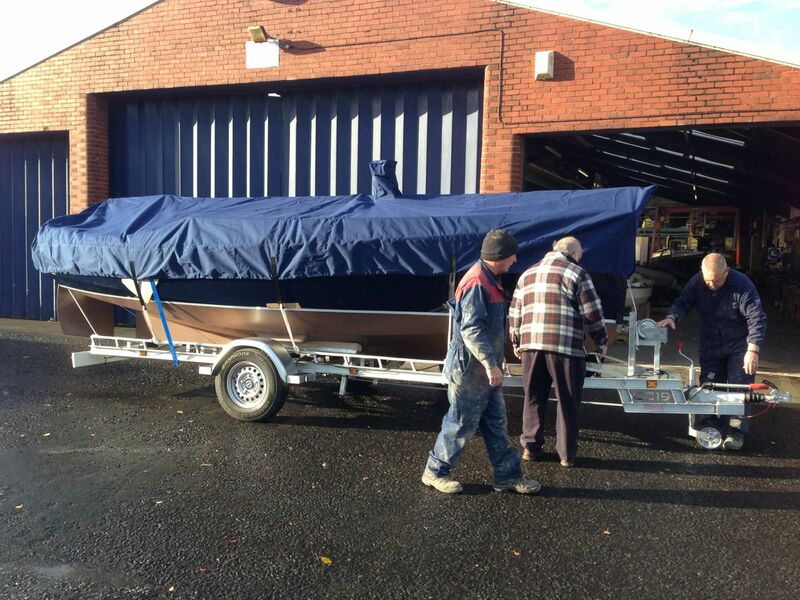 Progress continues, the sails have arrived from Hydes as have the furlers. As can be seen below the anchor well drain holes are in, the handrails, rubbing strake and samson post are on and the woodstain finished. 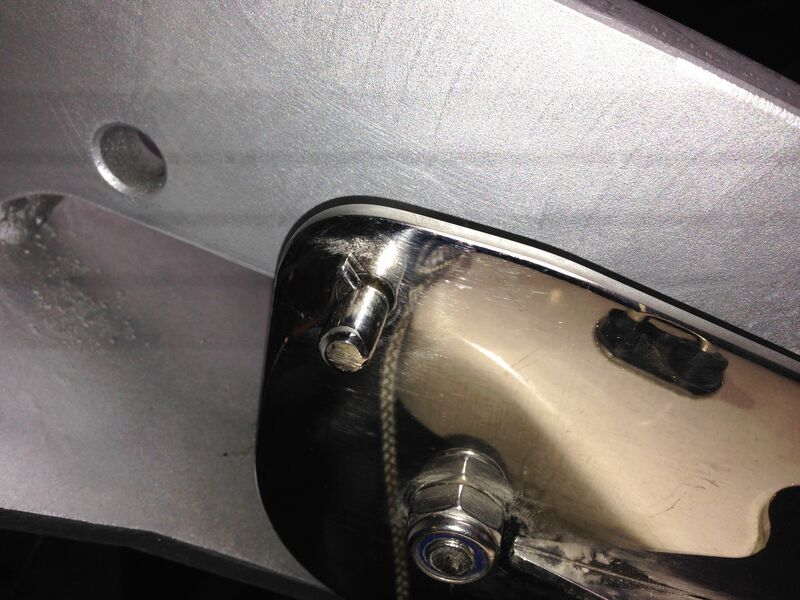 The additional stainless chafe plates by the fairleads are also on. Hull is awaiting the final polish. 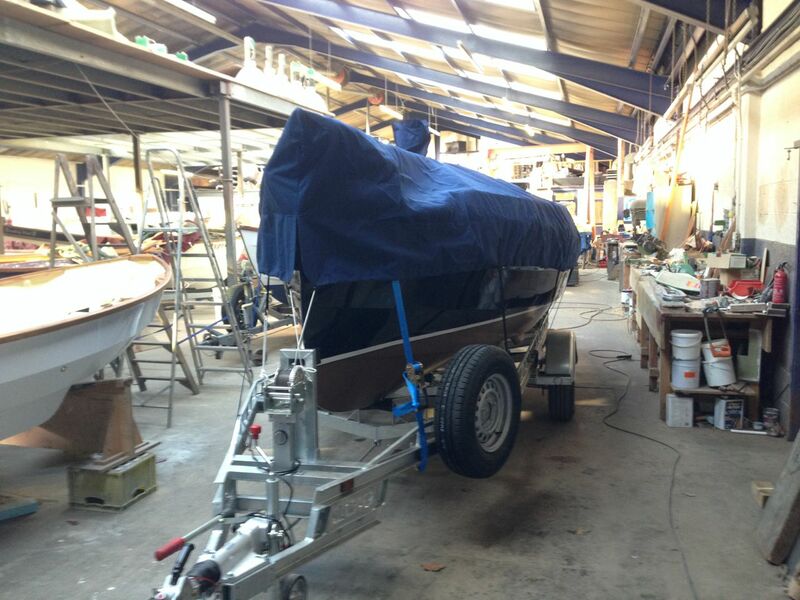 The coppercoating is done and the swim ladder fitted. 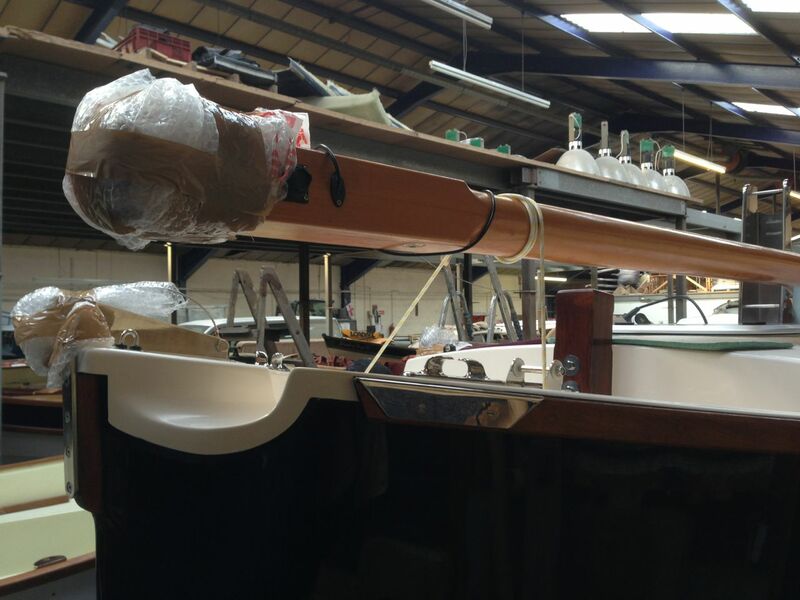 Up in the bows, everything looks finished apart from the stainless well drains which are awaiting delivery. 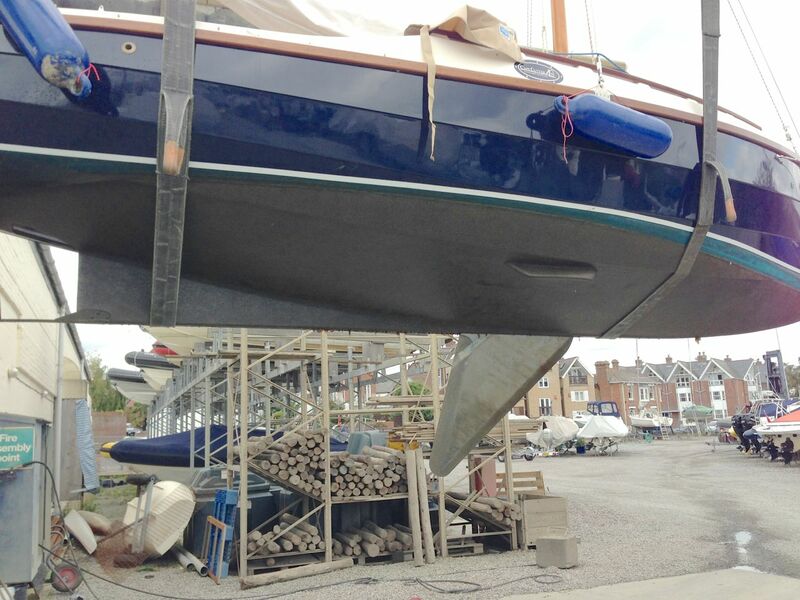 The anchor roller, fairlead, cleats and bowsprit mount are all there and the halyard blocks fitted on the coachroof. The build continues up at Honnor Marine in Rochdale. 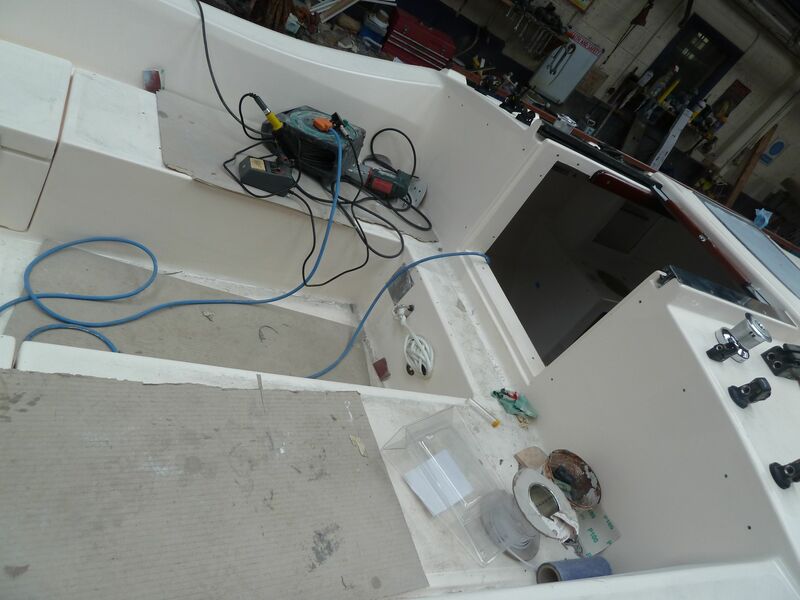 The deck, hull and inner moulding were all bonded a few weeks ago and as can be seen the hatch structures are now complete as is the wooden compression post. The forward drains are also plumbed in. 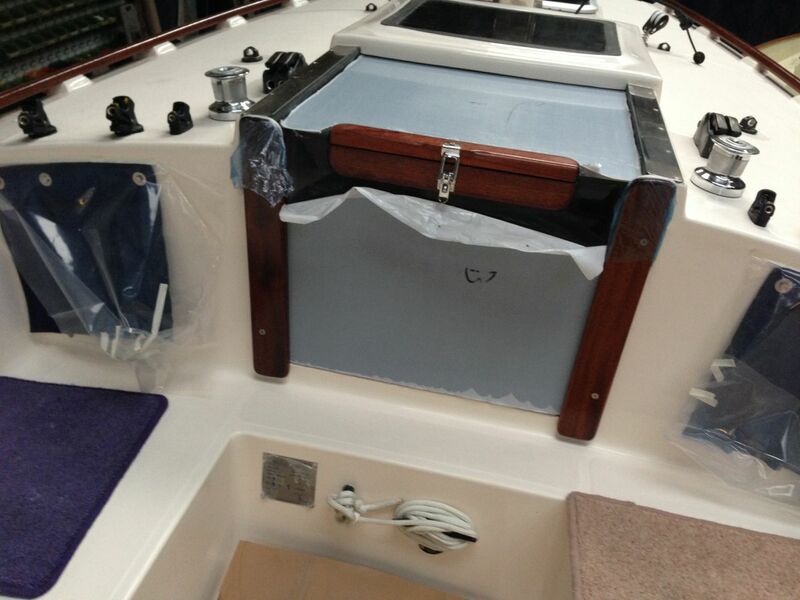 The visible bolts are the bolt throughs for the deck join and will eventually disappear behind the storage bags. 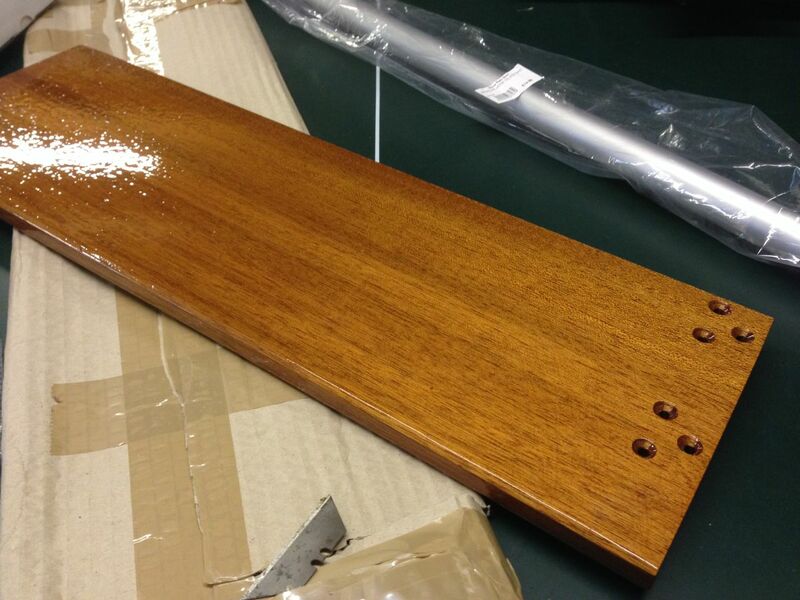 The centreboard and mechanism are finished and capped off. The masthead LED light can be seen reclining on the forward berth. The fuse panel, nicely mounted on a varnished plinth is in as is the12v socket. I have gone for a different style of light to the current standard 4 LED strip lights. I prefer the older style spotlights, fitted with LED bulbs as they seem more in keeping with the traditional style of the boat. There is also another dome LED light centrally which has yet to be fitted. 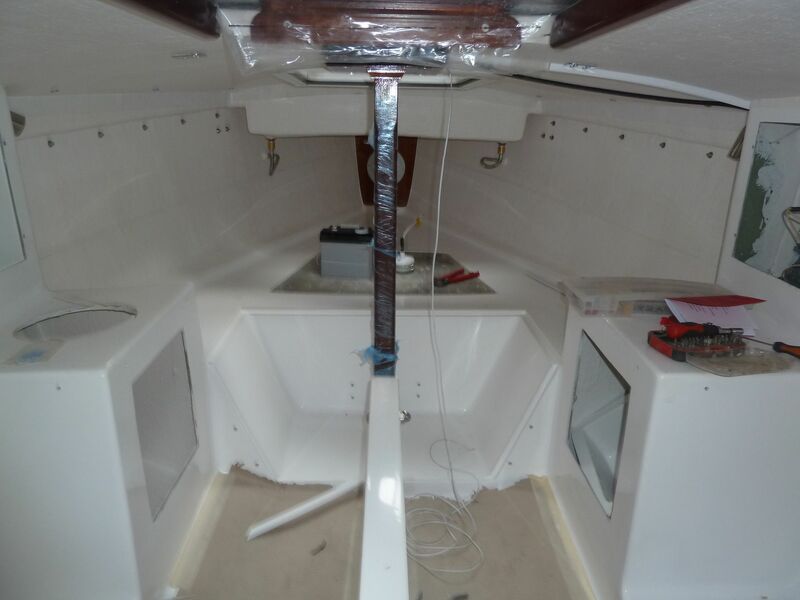 The power cable and ‘shunt’ are awating fitment and eventually the floor will have two flexteak panels fitted. 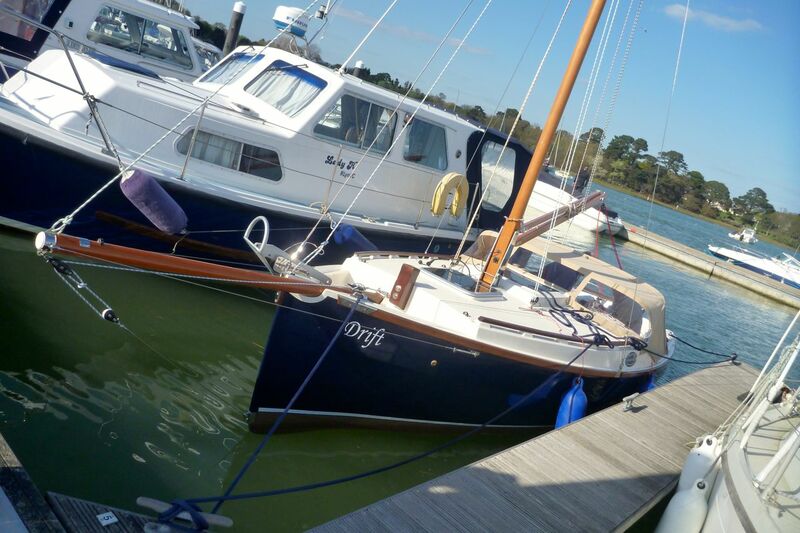 The race to the water between Drift and Lucy is looking distinctly one sided at the moment with the chaps at Mylor really flying along – that said we have all read the story of the tortoise and the hare.. 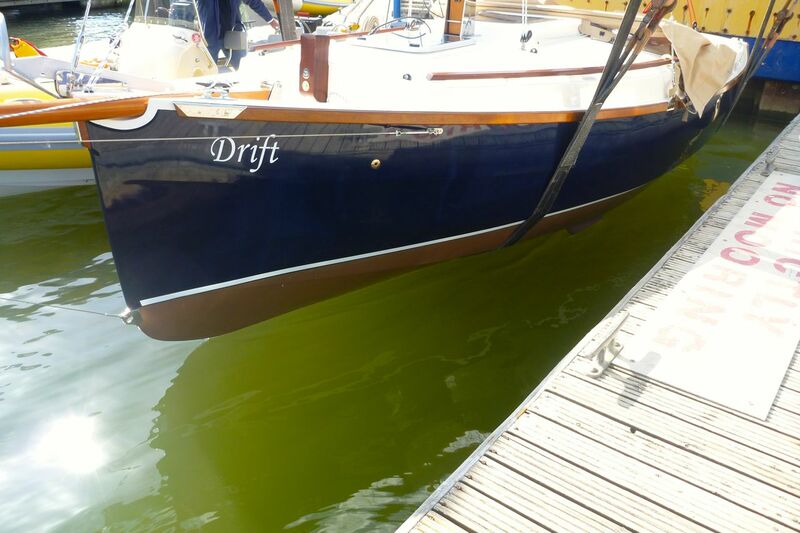 The gestation of ‘Drift’ has been quite lengthy, but now the diversion of the boat show is over, the word from up North is a “couple of weeks or so”. 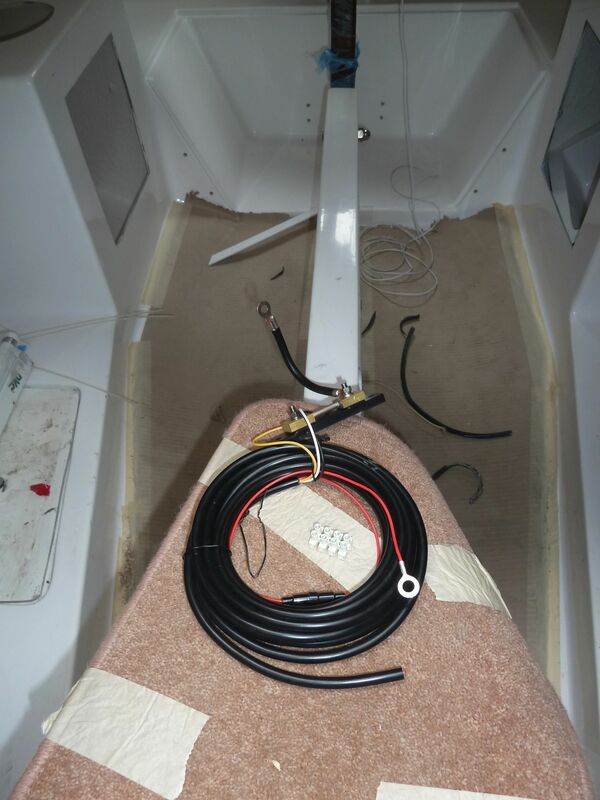 Given that the mast wiring is happening and a battery is being added, its all sounding hopeful. There seems to be two schools of thought regarding electrics on these boats. Either no fixed electrics at all to keep it simple, or rig like a small cruiser. 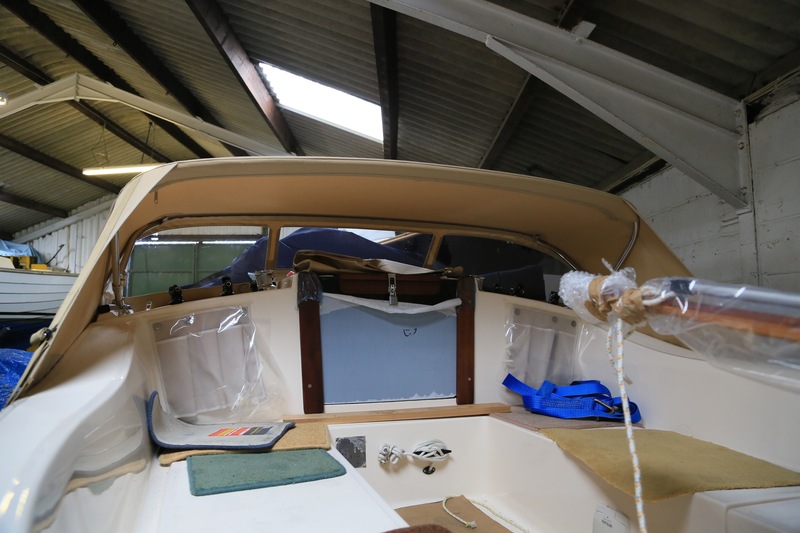 Drift will have a standard battery driving LED cabin lights, an LED masthead tricolour, a fixed VHF and then a single instrument combining Depth, Speed (GPS) and charts. This avoids a paddlewheel through the hull, but gives plenty of information for short cruises all together in a small package. 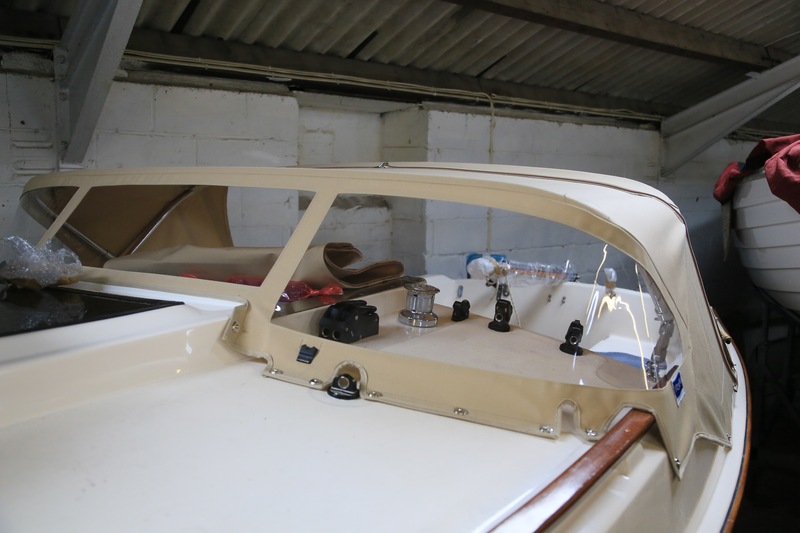 Having given thought to the charging, the current plan is to use a loose solar panel mounted on a backing board (possibly the NASA 10 Amp), which will generally be left out when moored. There is conflicting advice about the need for a regulator. I have been told that provided that the panel is 1/10th of the amp hours of the battery (100Amh in this case) and provided it has a diode to stop reverse discharge, then there is no need for a regulator, although the advice varies. 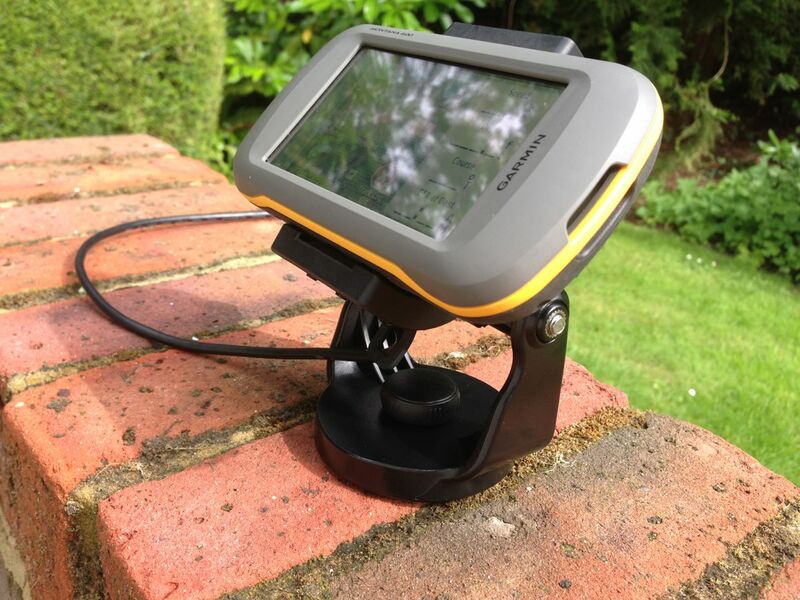 The panel will be supplemented by a small CTEK charger/conditioner for top ups when marina berthed. I am not adding a charging circuit on the outboard, as its not my intention to motor for long periods and the charge from these is not perhaps as useful as I had first thought. 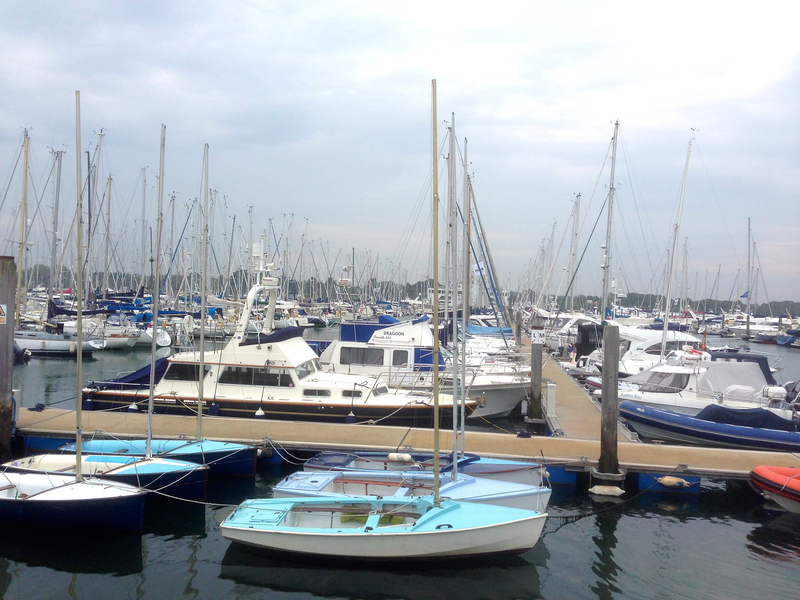 The great thing about shallow draft boats is how many more creeks can be found around our coasts even in busy areas such as the Solent. We will certainly be seeking out some of these quieter local anchorages in the next couple of years. 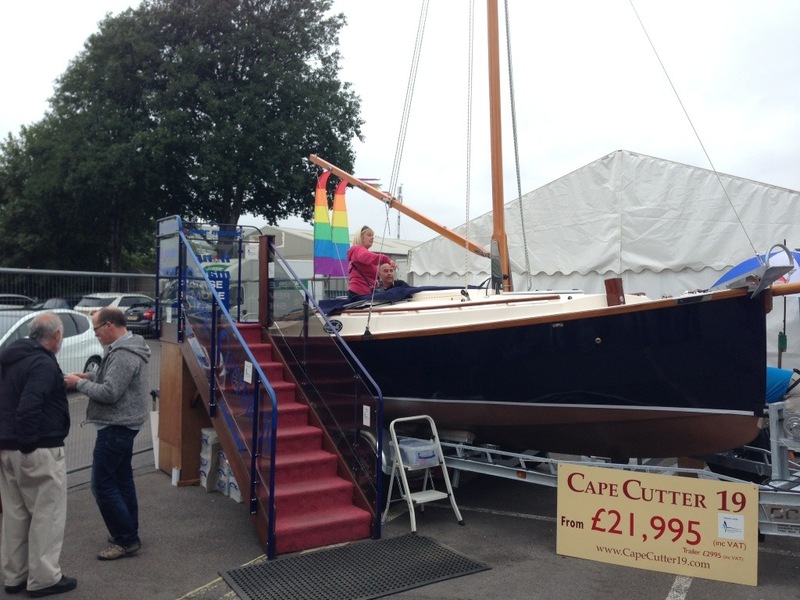 We went to the Southampton boat show today, where Honnor Marine had a stand with some of their craft, including the Cape Cutter. 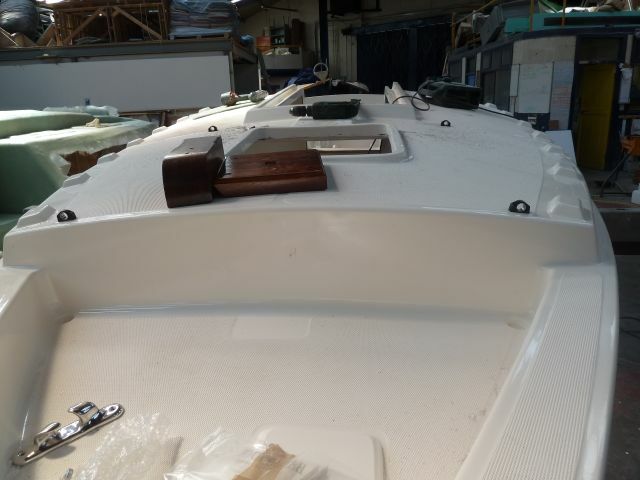 With Drift getting close to completion, it was particularly useful to be able to crawl over a finished boat and take some measurements as we consider the ” bits ” we want on the boat. 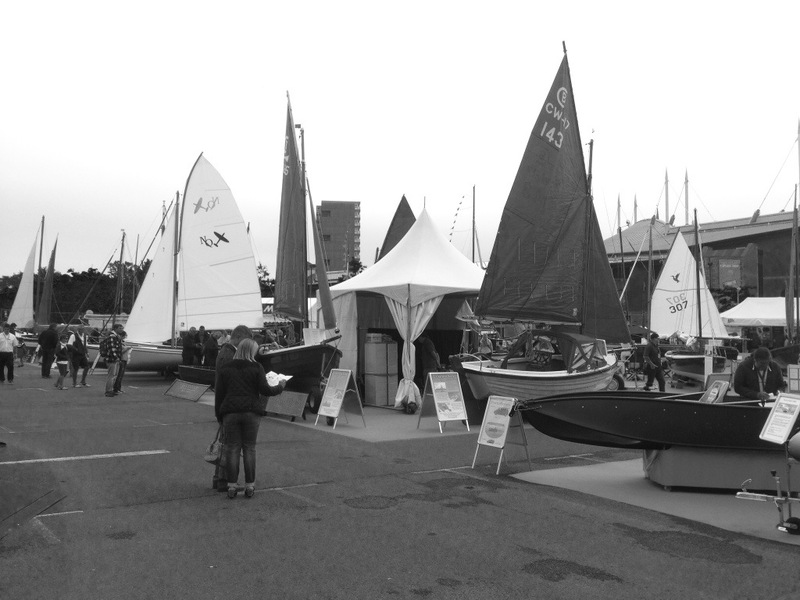 There were plenty of other interesting boats on show. 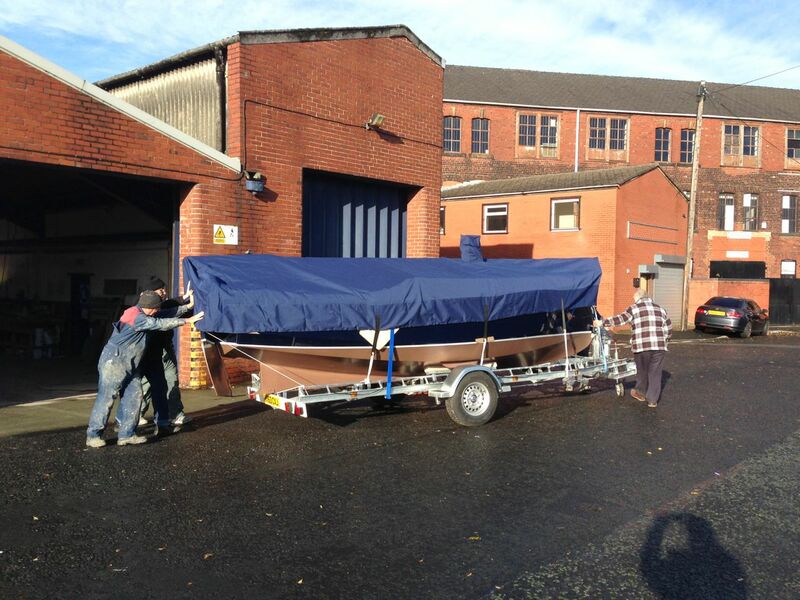 There was a yet another 19ft gaffer on a trailer, this time the Windhunter from Poland. 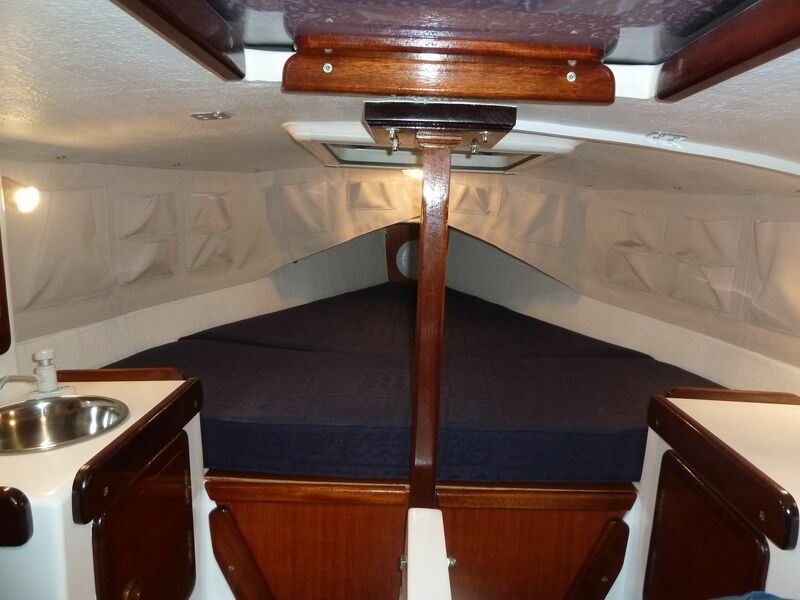 Massive cabin, but no centreboard and small sail area. 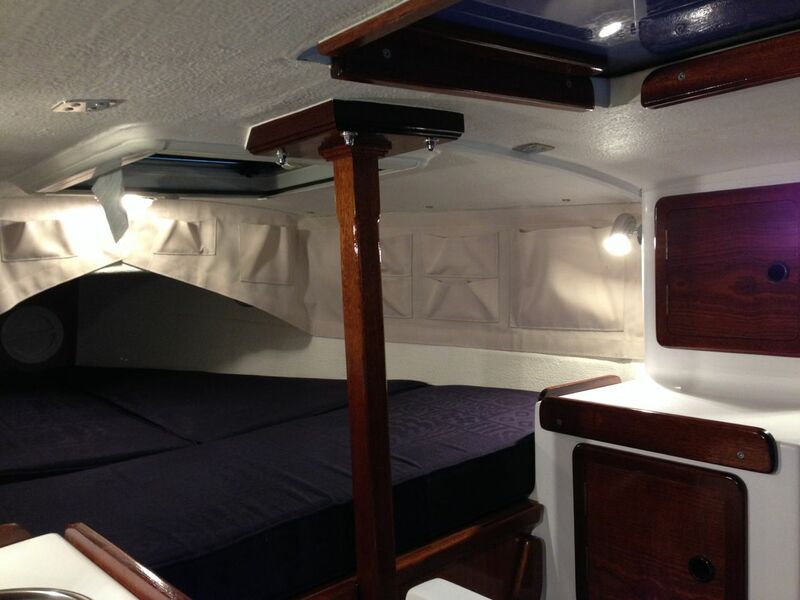 Lots of space, but not the best looking boat – really quite dumpy with such a high coach roof . Big volume for the money (similar price to the Cape Cutter), but doesn’t look like it would handle weather that well. 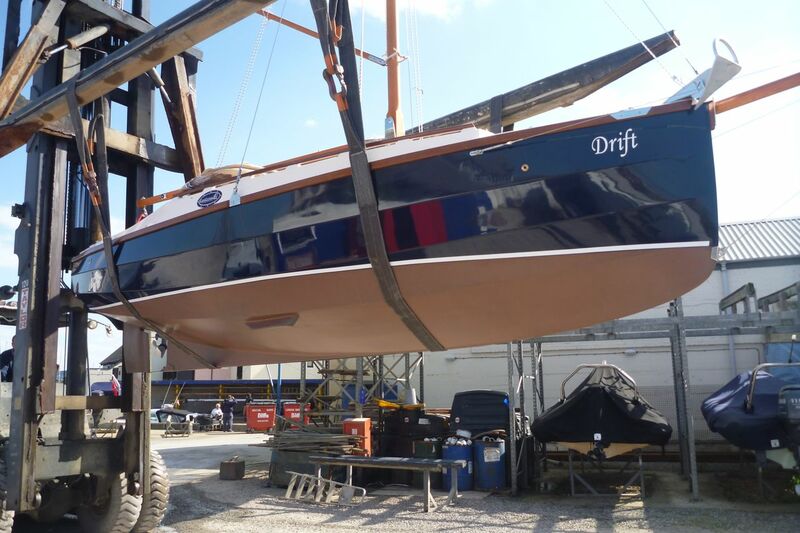 Drift is currently in build at Honnor Marine. 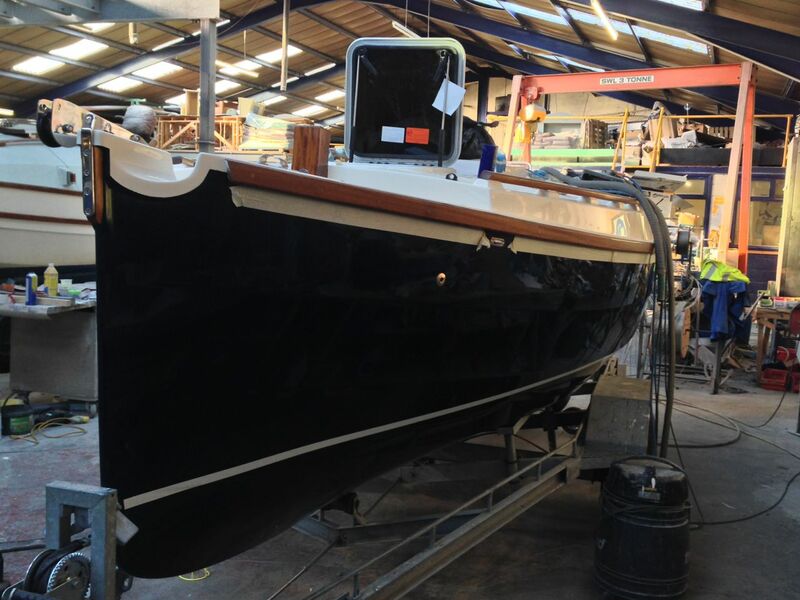 As with any new boat there have been many things to consider – Hull colour, Sails, outboard, extent of electrics, etc etc. 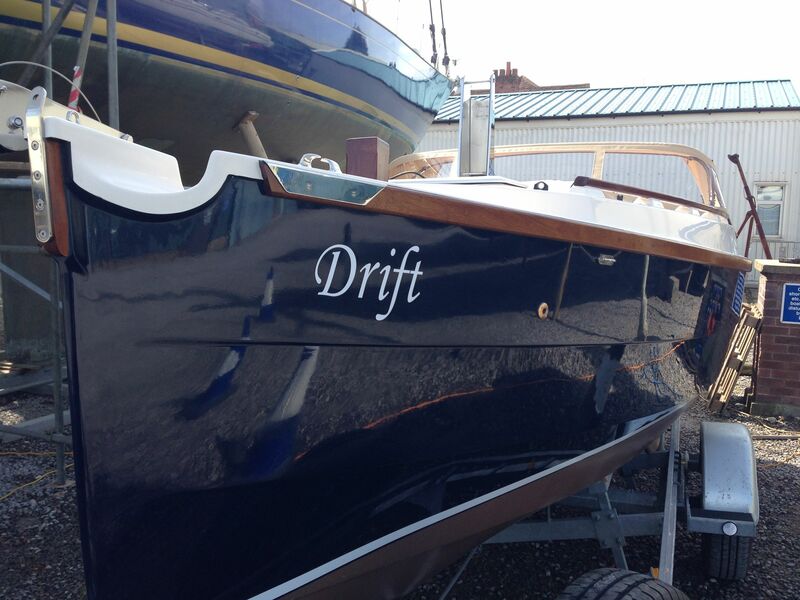 Drift is blue with cream sails. 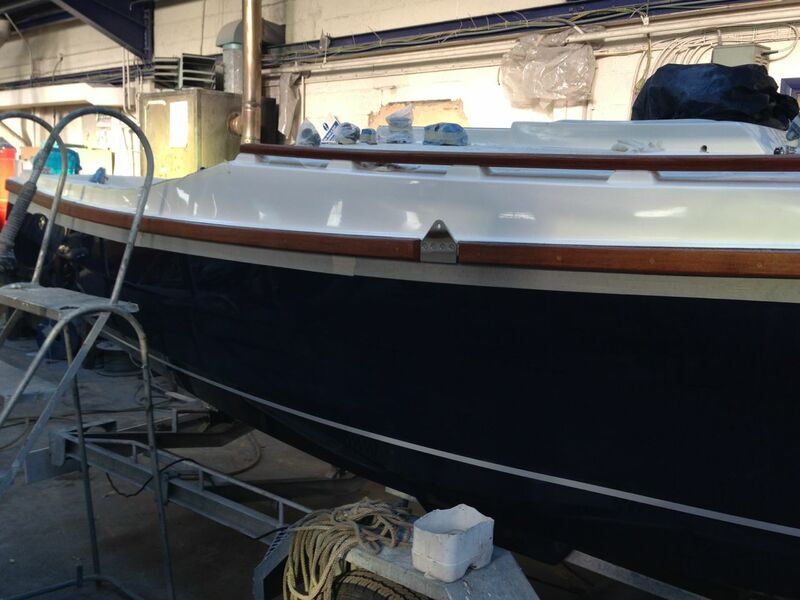 As with any build, it always takes longer than expected, but she is nearing completion and should be ready before the end of September 2013.